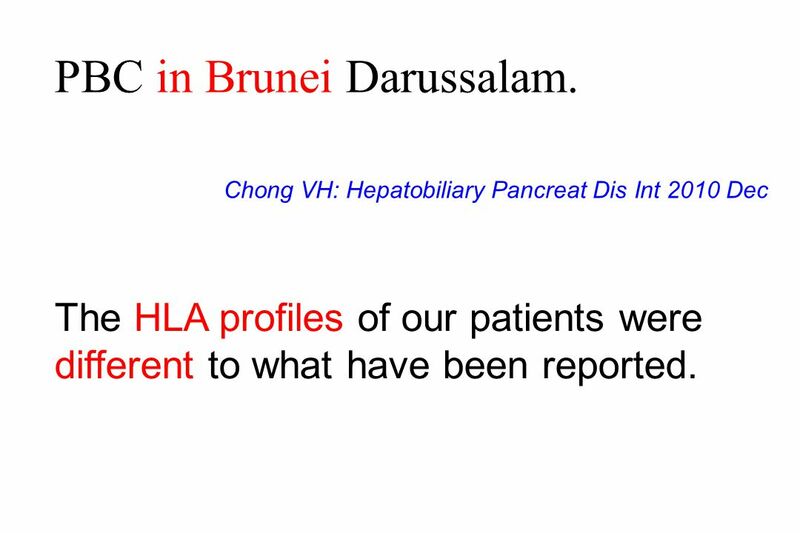 9 PBC in Brunei Darussalam. 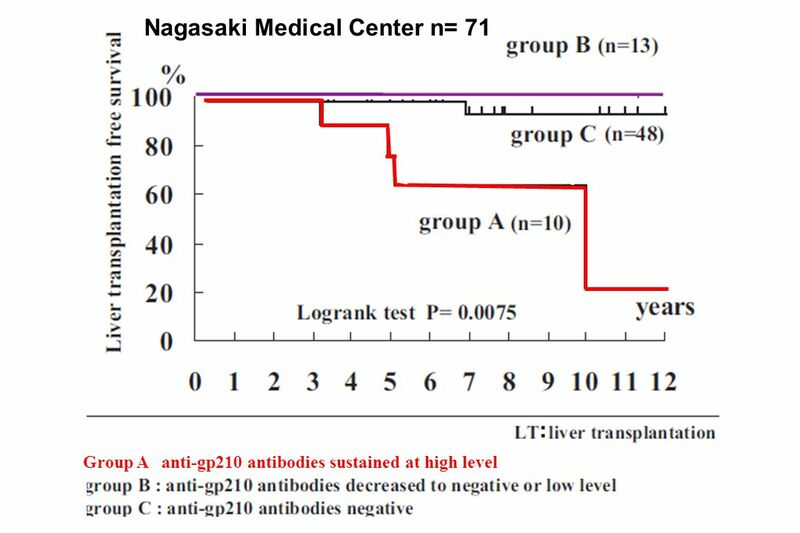 Chong VH: Hepatobiliary Pancreat Dis Int 2010 Dec The HLA profiles of our patients were different to what have been reported. 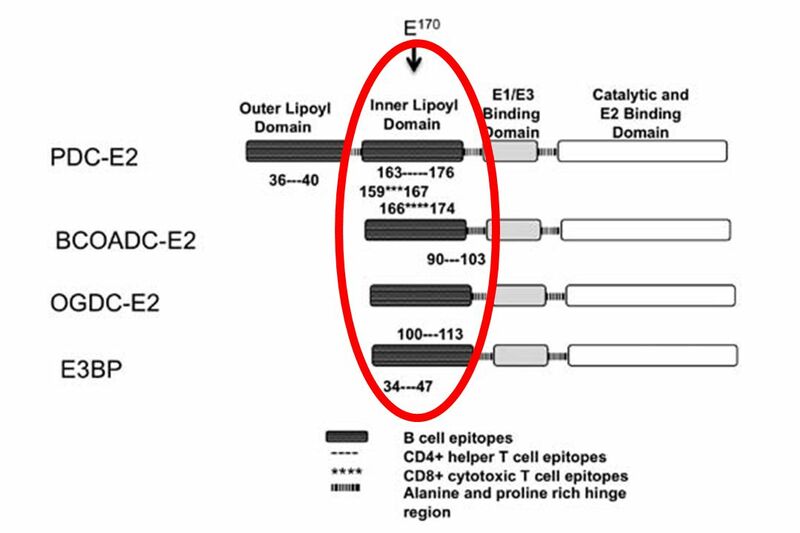 14 Epigenetic investigation of variably X chromosome inactivated genes in monozygotic female twins discordant for PBC. 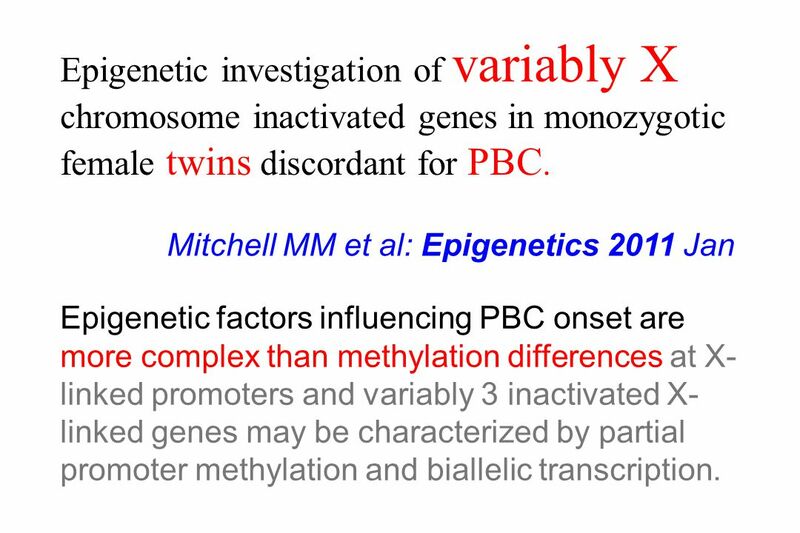 Mitchell MM et al: Epigenetics 2011 Jan Epigenetic factors influencing PBC onset are more complex than methylation differences at X-linked promoters and variably 3 inactivated X-linked genes may be characterized by partial promoter methylation and biallelic transcription. 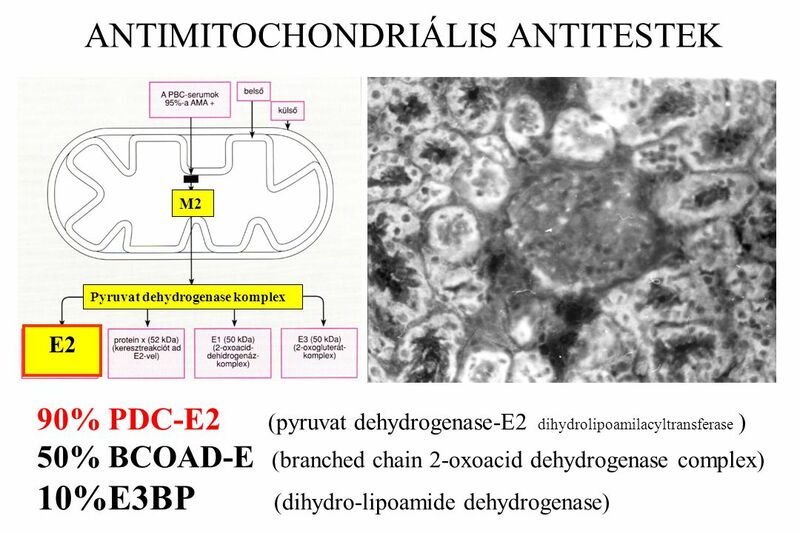 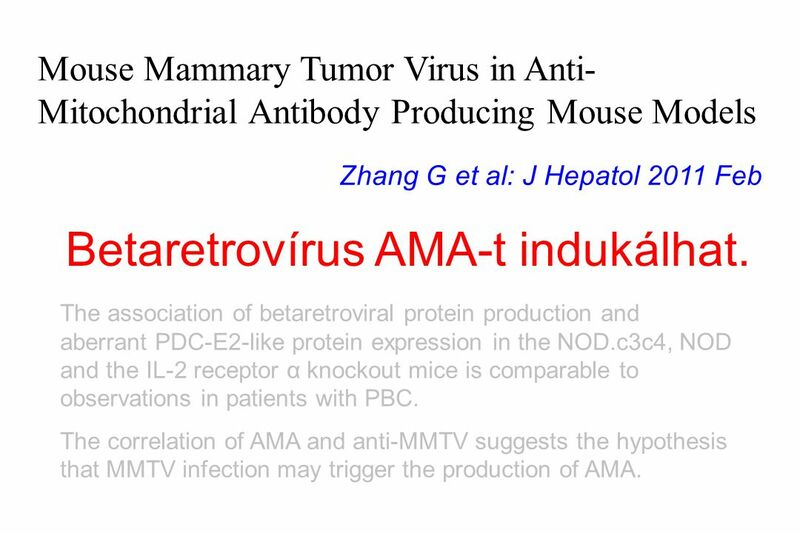 Mouse Mammary Tumor Virus in Anti-Mitochondrial Antibody Producing Mouse Models Zhang G et al: J Hepatol 2011 Feb Betaretrovírus AMA-t indukálhat. 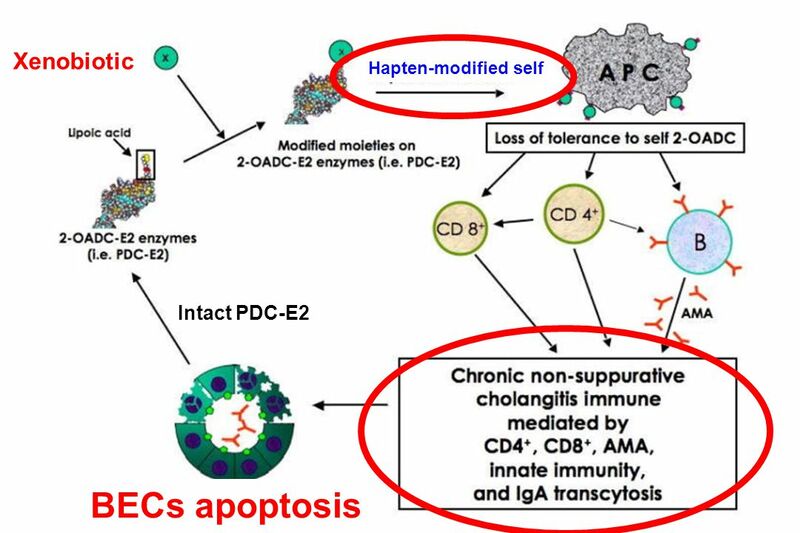 The association of betaretroviral protein production and aberrant PDC-E2-like protein expression in the NOD.c3c4, NOD and the IL-2 receptor α knockout mice is comparable to observations in patients with PBC. 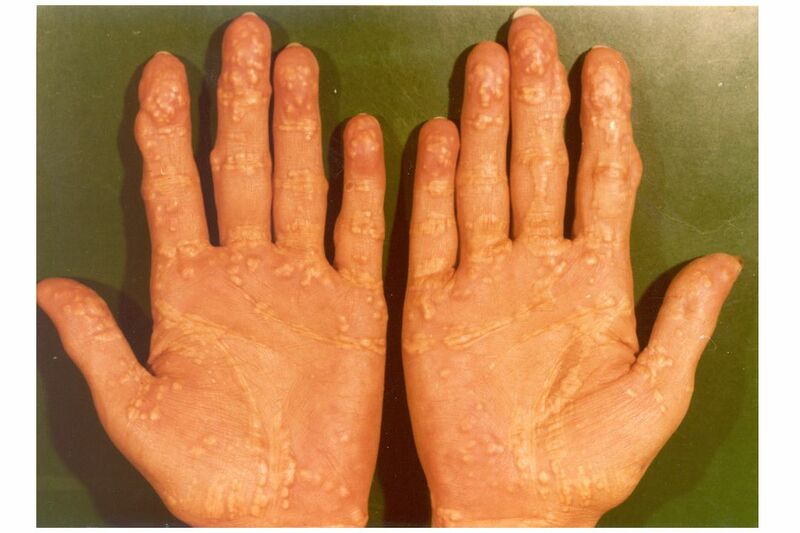 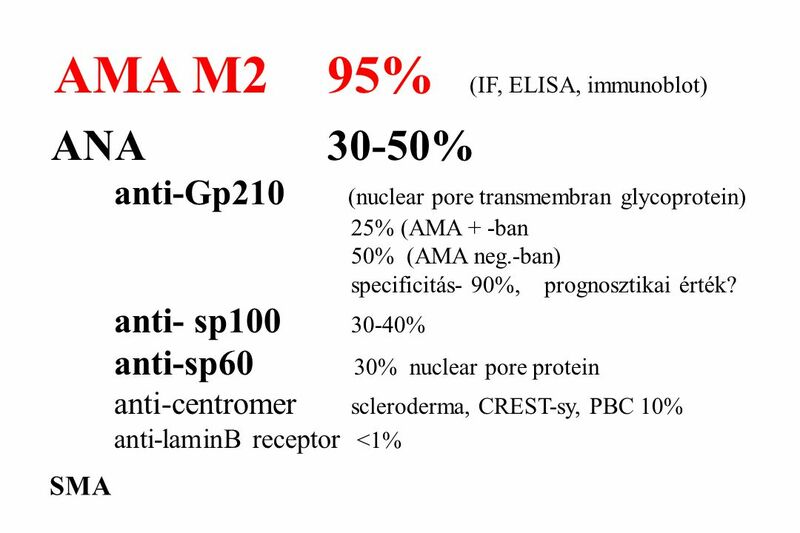 The correlation of AMA and anti-MMTV suggests the hypothesis that MMTV infection may trigger the production of AMA. 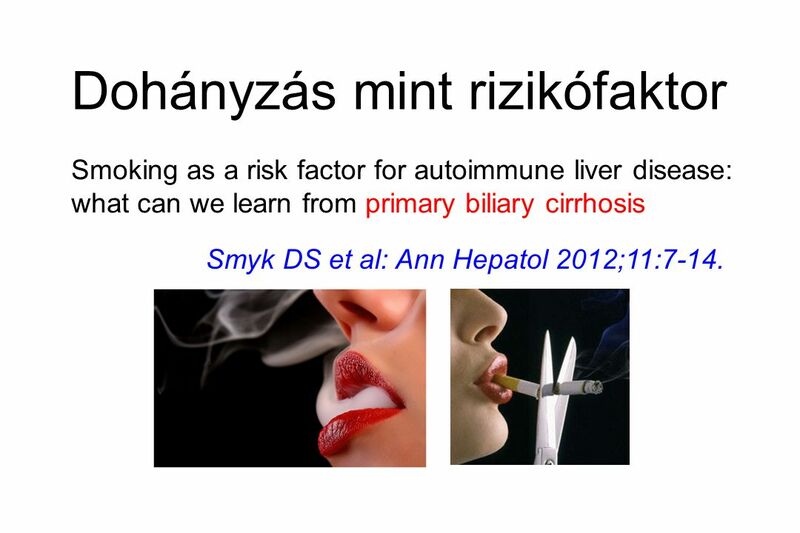 Smoking as a risk factor for autoimmune liver disease: what can we learn from primary biliary cirrhosis Smyk DS et al: Ann Hepatol 2012;11:7-14. 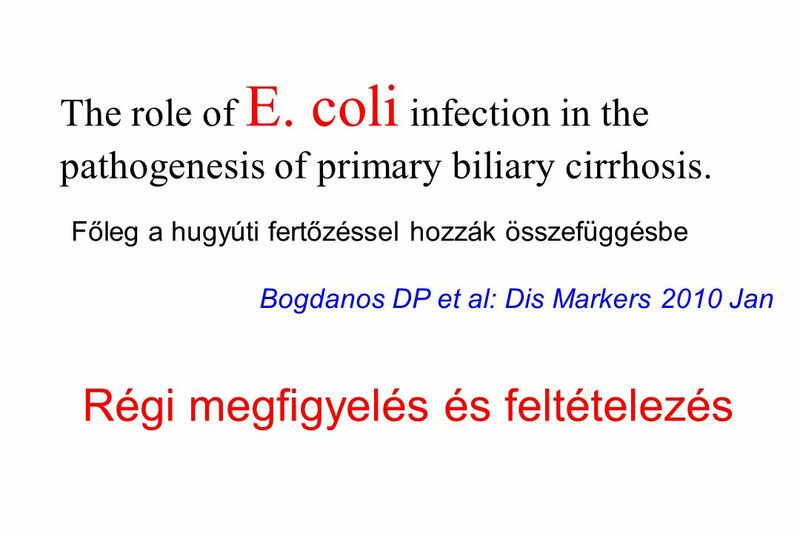 30 A biliaris epitheliális sejt (BEC) másképpen „öregszik”. 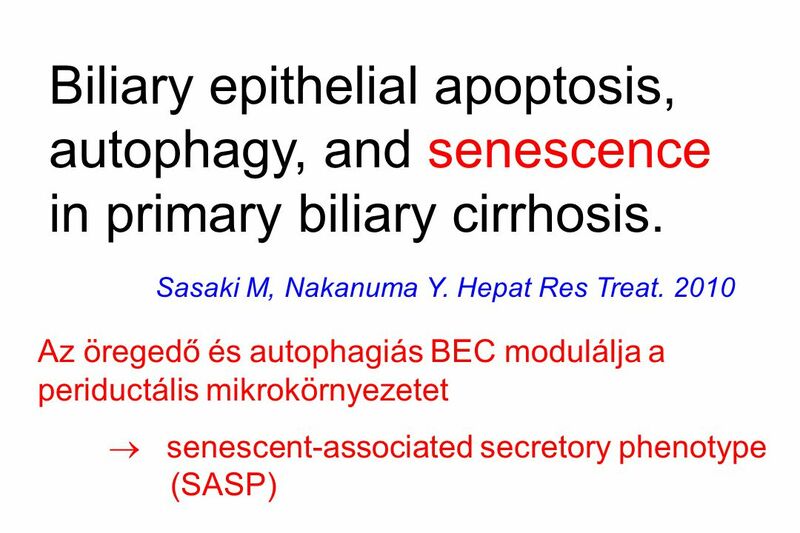 31 Biliary epithelial apoptosis, autophagy, and senescence in primary biliary cirrhosis. 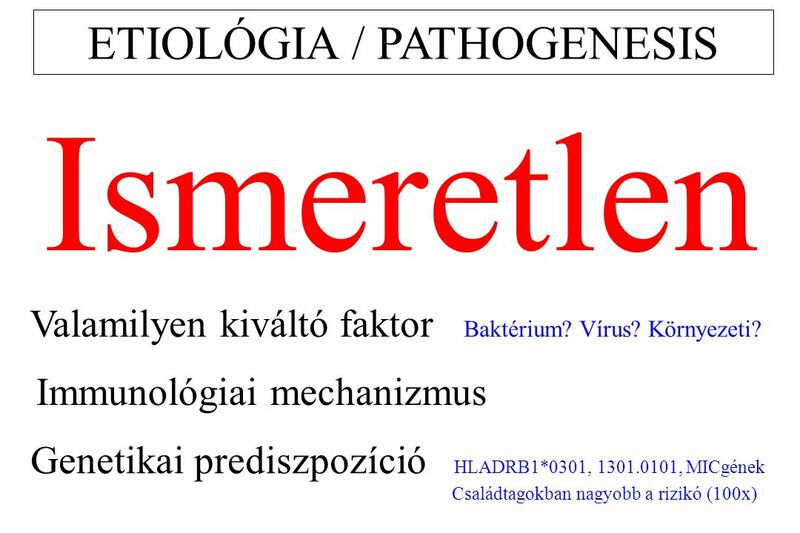 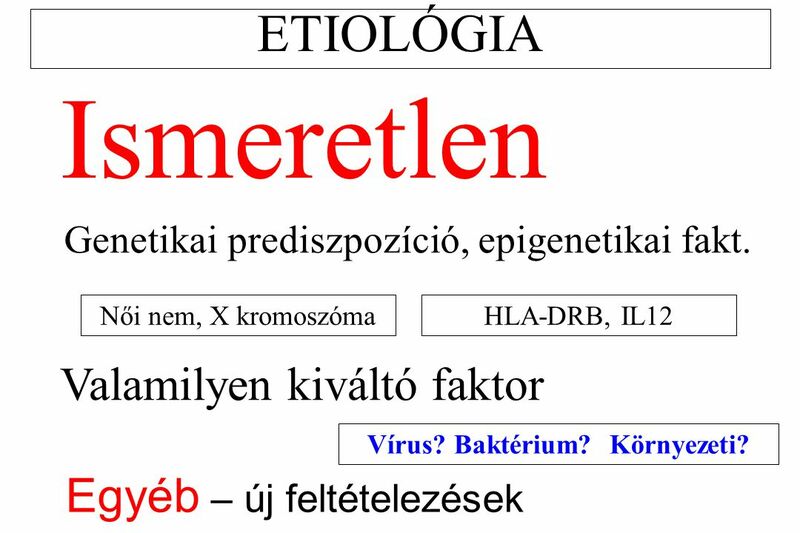 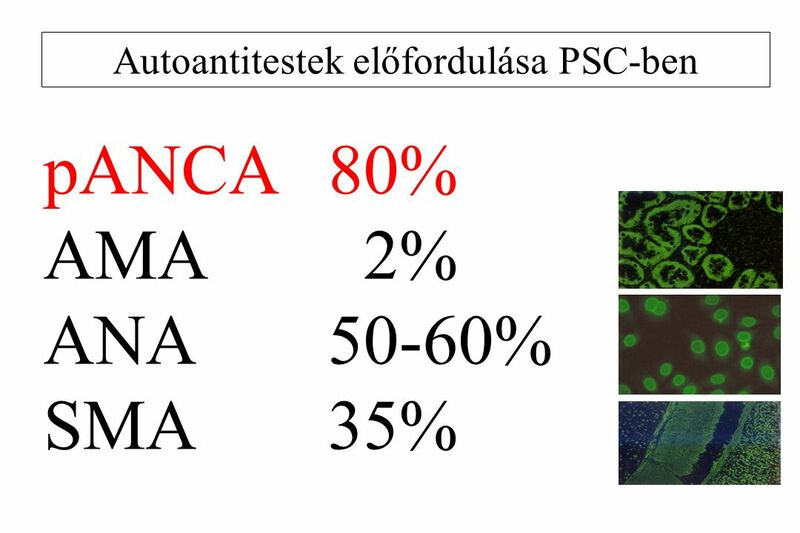 39 A pathogenezisben szerepe lehet. 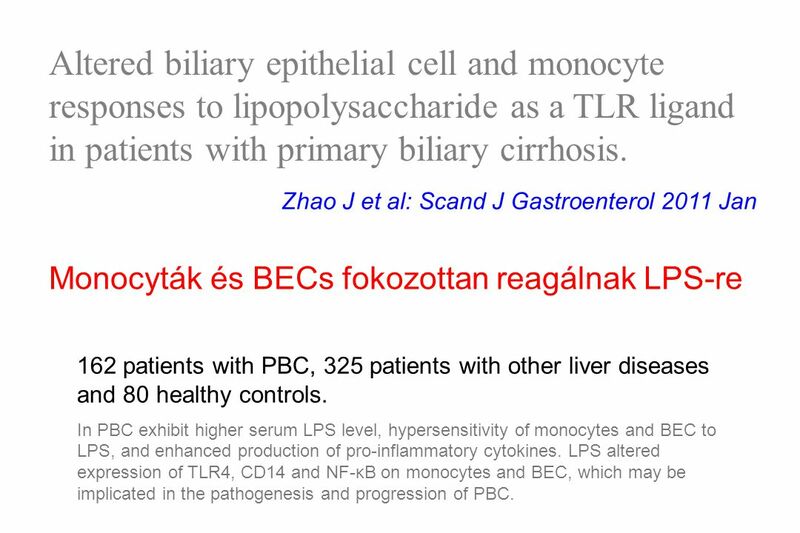 40 Altered biliary epithelial cell and monocyte responses to lipopolysaccharide as a TLR ligand in patients with primary biliary cirrhosis. 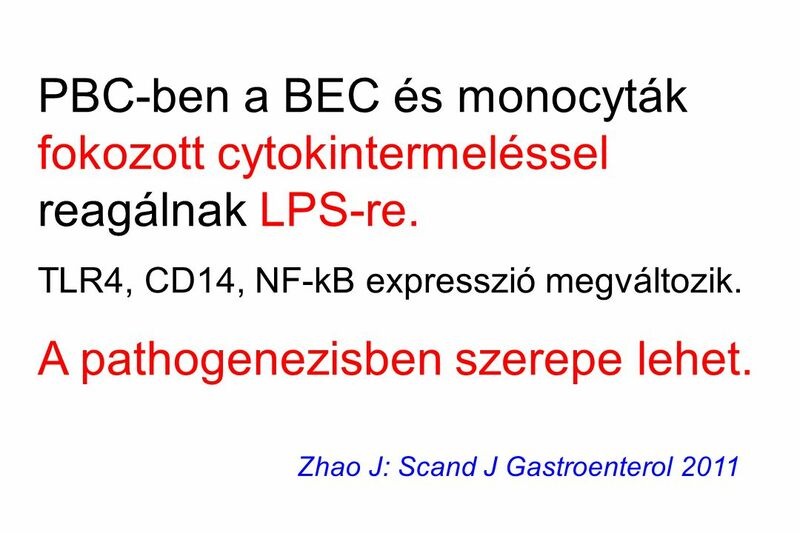 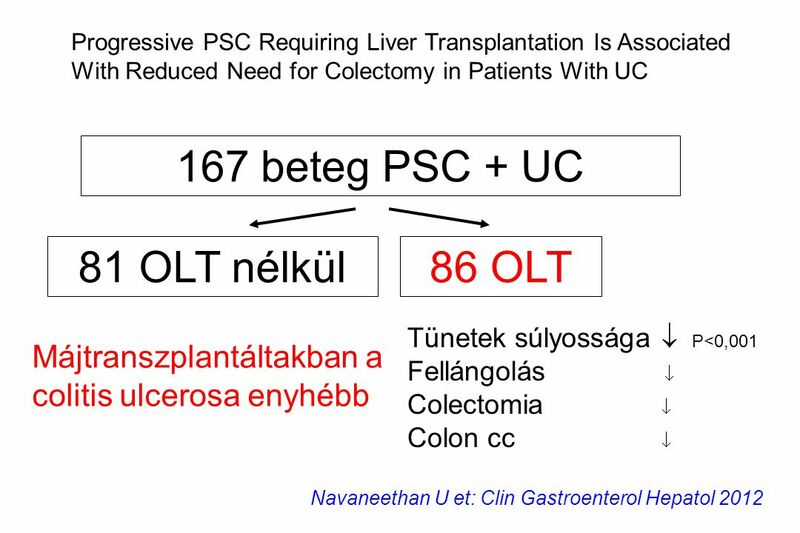 Zhao J et al: Scand J Gastroenterol 2011 Jan Monocyták és BECs fokozottan reagálnak LPS-re 162 patients with PBC, 325 patients with other liver diseases and 80 healthy controls. 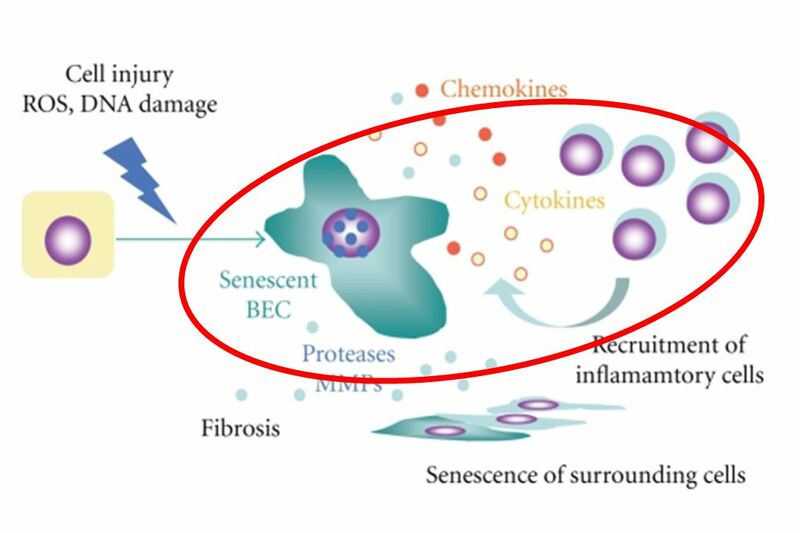 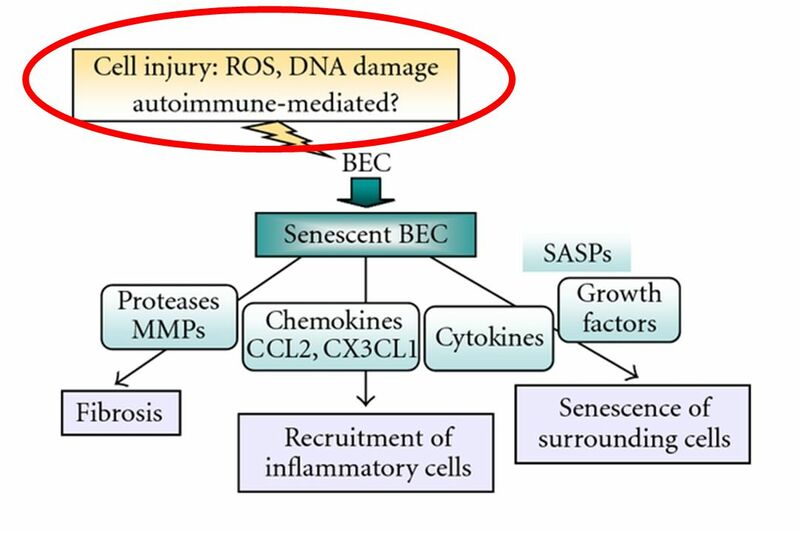 In PBC exhibit higher serum LPS level, hypersensitivity of monocytes and BEC to LPS, and enhanced production of pro-inflammatory cytokines. 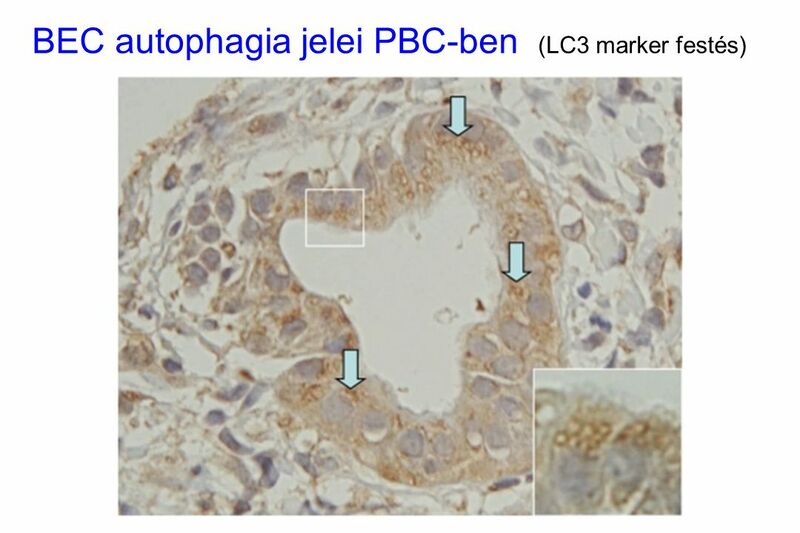 LPS altered expression of TLR4, CD14 and NF-κB on monocytes and BEC, which may be implicated in the pathogenesis and progression of PBC. 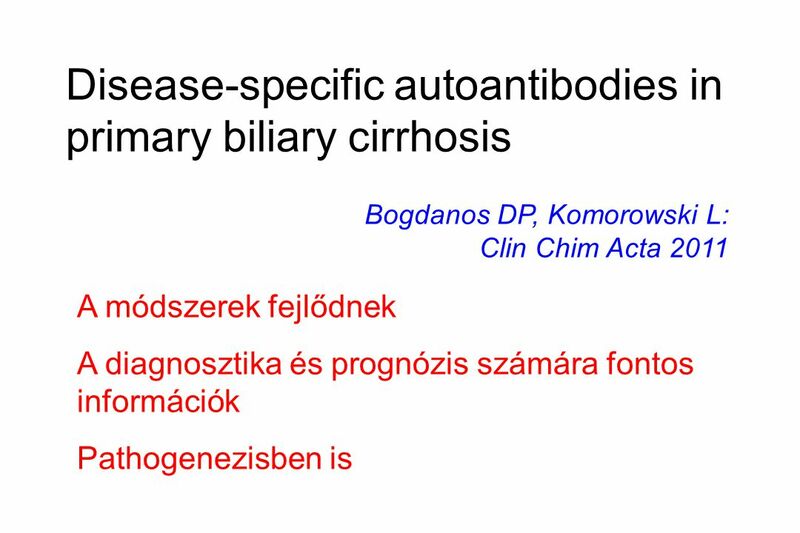 52 Autoantibodies to GW bodies and other autoantigens in primary biliary cirrhosis. 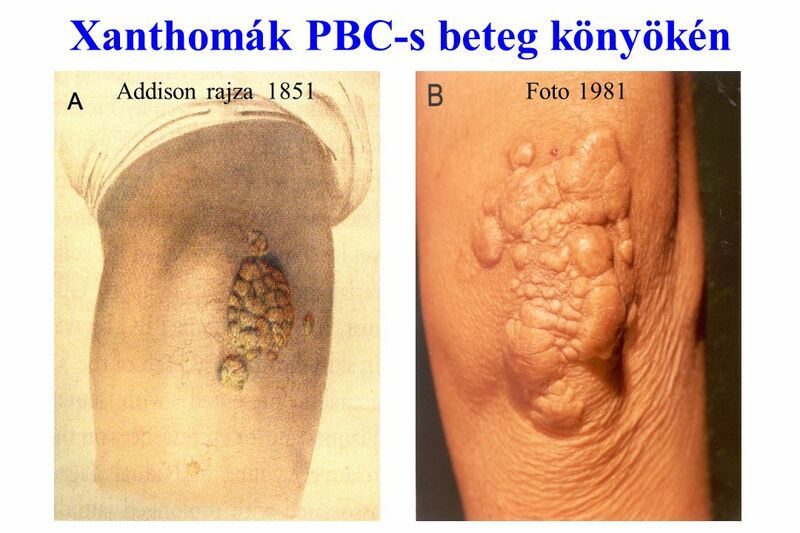 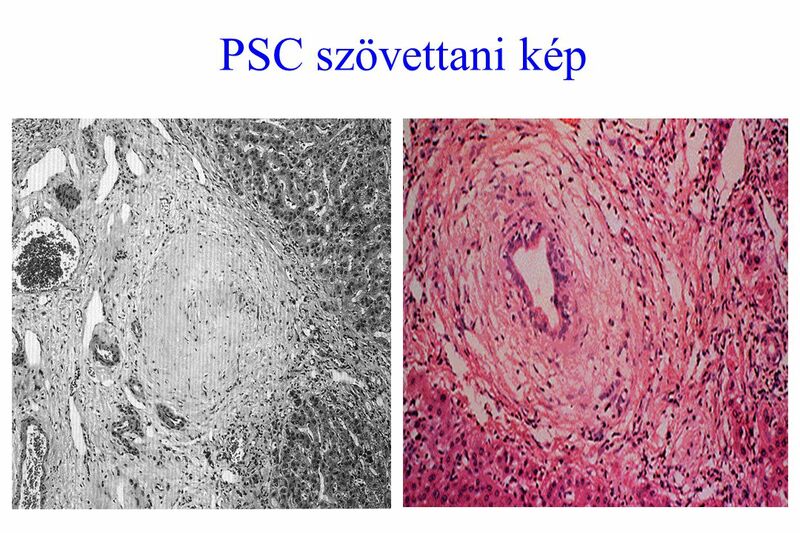 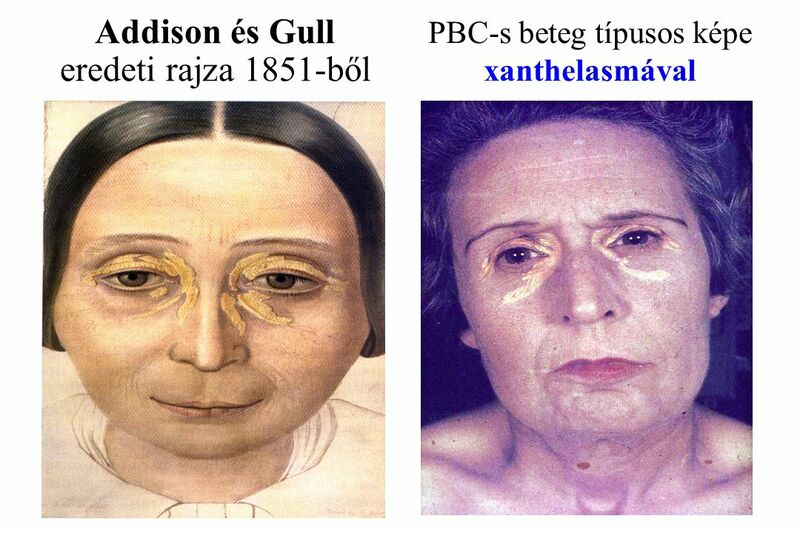 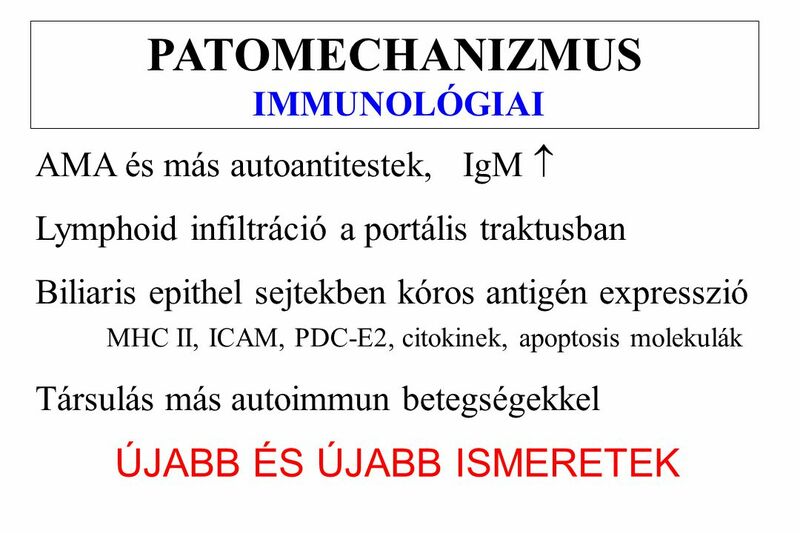 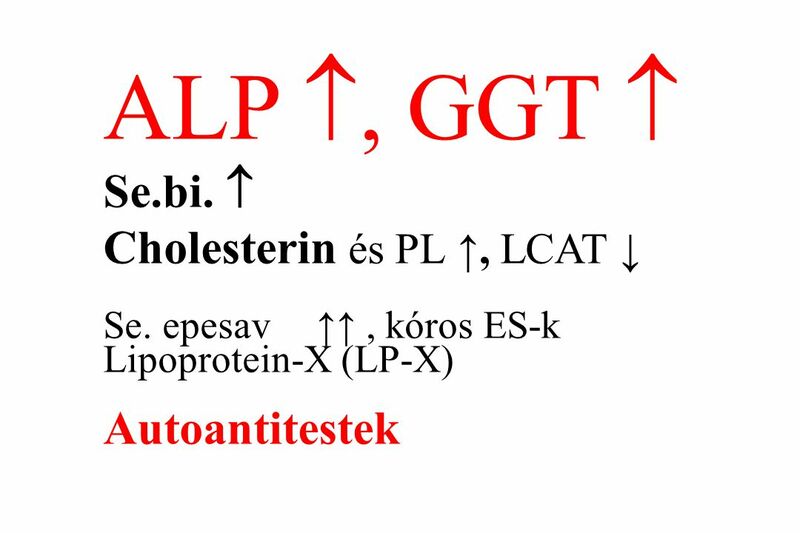 Stinton LM et al: Clin Exp Immunol 2011 Feb Új antitest PBC-ben G (glycine) W (tryptophan)-containing bodies (GWB) A cytoplazmában található testek, amelyek az mRNA feldolgozásban vesznek részt az RNA interferencia (RNAi) útján Autoimmun neuropathiában mutatták ki először (2002) Antibodies to RAP55, GW182 and GRASP-1 are the most common GWB targets in PBC. 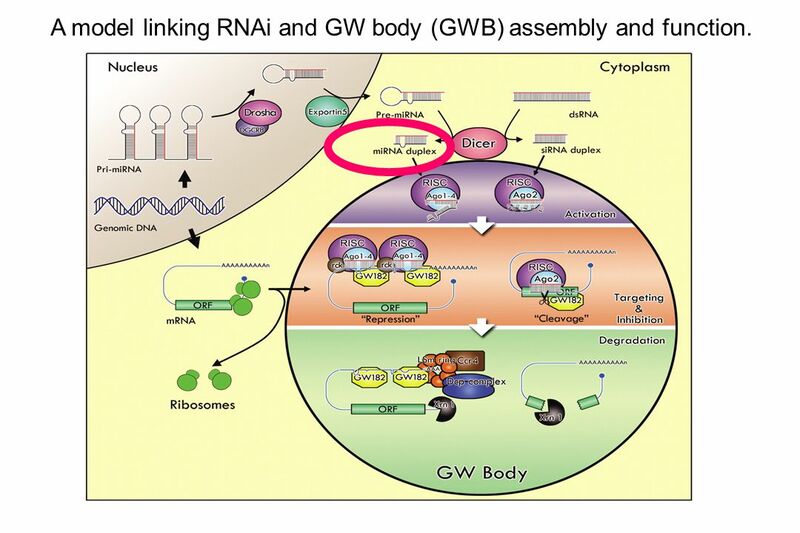 53 A model linking RNAi and GW body (GWB) assembly and function. 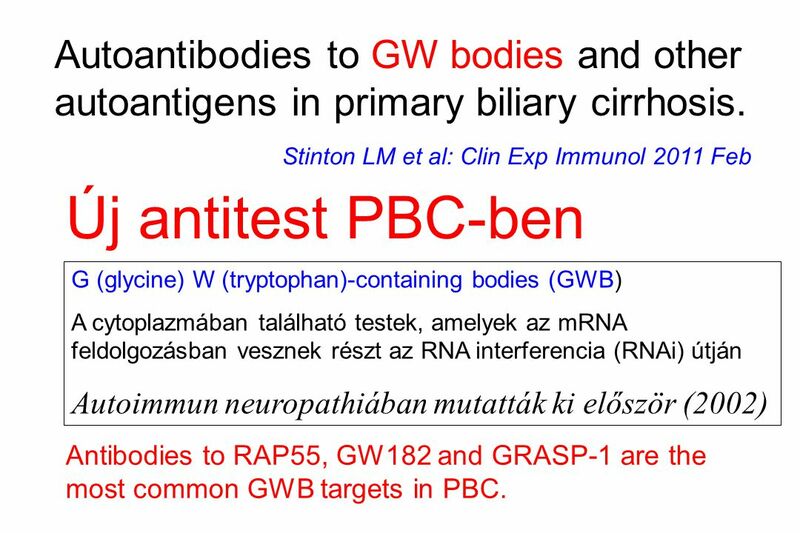 A model linking RNAi and GW body (GWB) assembly and function. 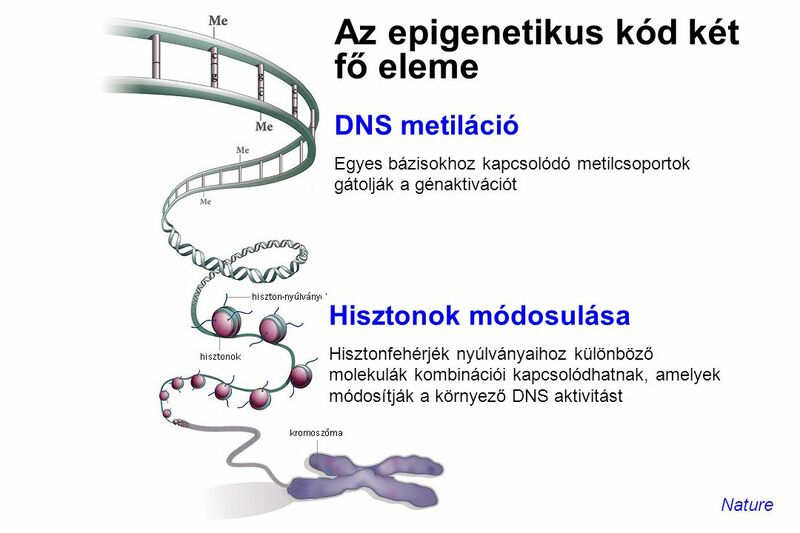 RNAi activity is triggered by siRNA/miRNA duplexes, which are first processed from either double-stranded RNA (dsRNA) or precursor microRNA (pre-miRNA), respectively, by the RNase-III-type endonuclease Dicer. 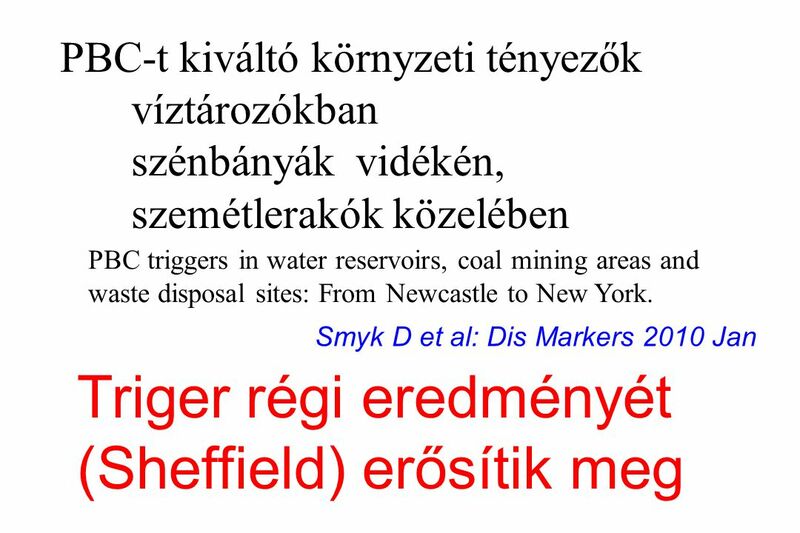 These duplexes are then incorporated into RISC, where the passenger strand (black) is either cleaved and degraded or removed by the bypass mechanism (Matranga et al., 2005). 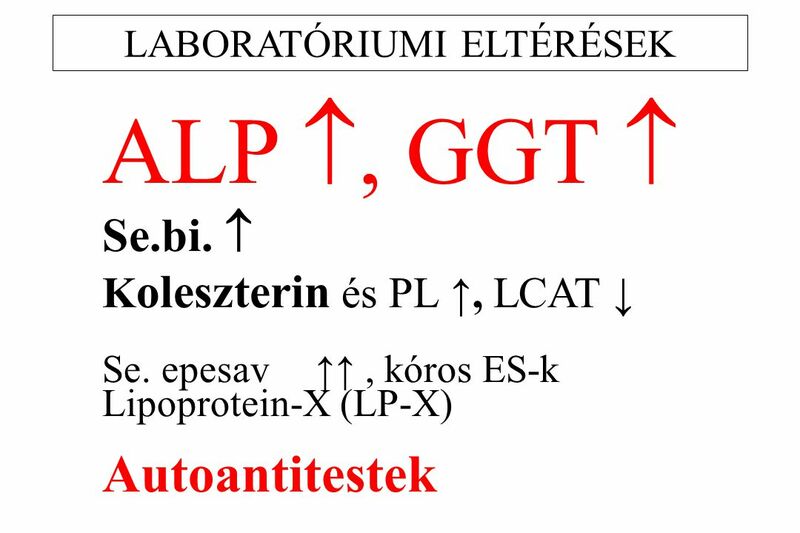 This activation process and assembly of the guide strand (red) into RISC is thought to initiate early stages of GWB formation. 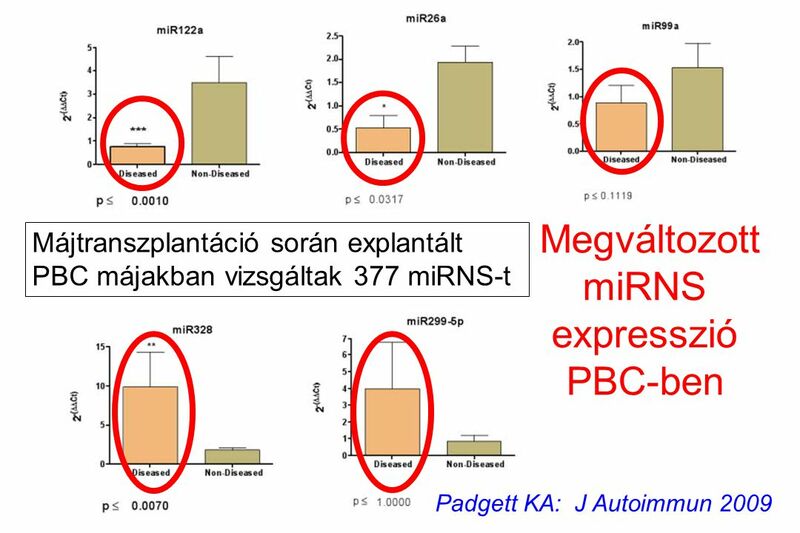 Subsequent targeting by RISC results in further recruitment of one or more heteromeric protein complexes (which could include GW182 and RCK/p54) on the mRNA, which forms a specific RNP structure that causes post-transcriptional inhibition of gene expression (through siRNA-mediated cleavage or miRNA-mediated translational repression, depending on the degree of complementarity between the guide-strand RNA and its target mRNA). 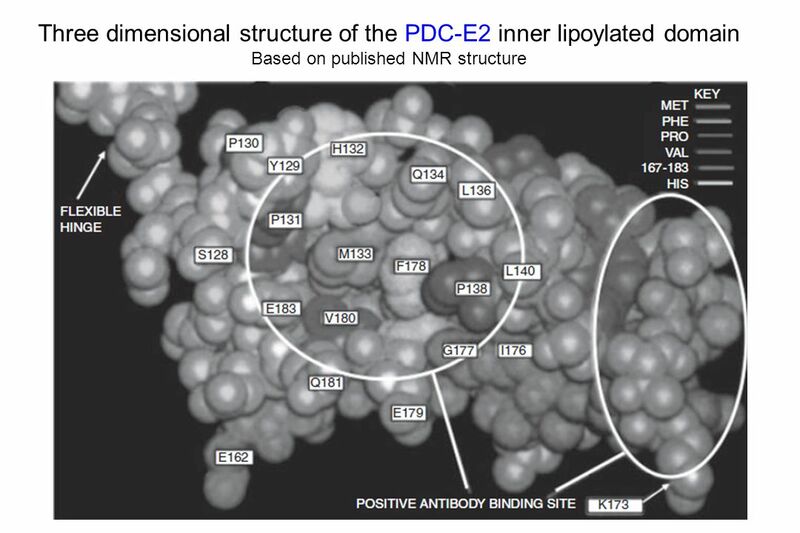 The targeted mRNA is eventually degraded by further recruitment of 5′-to-3′ mRNA decay factors, which include the deadenylase Ccr4, decapping factors (LSm1-7 ring, Dcp complex) and the 5′-to-3′ exonuclease Xrn1. 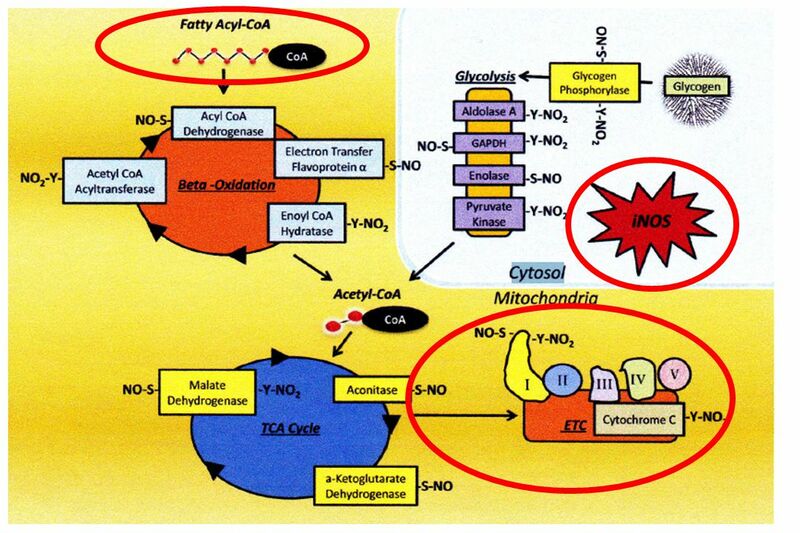 The accumulation of RNA decay factors during degradation could be responsible for the size increases in GWBs, which makes them visible by conventional light microscopy. 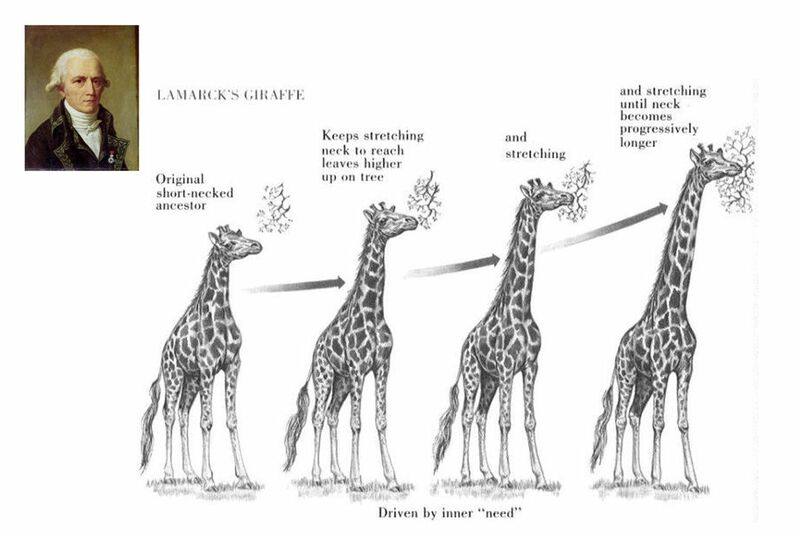 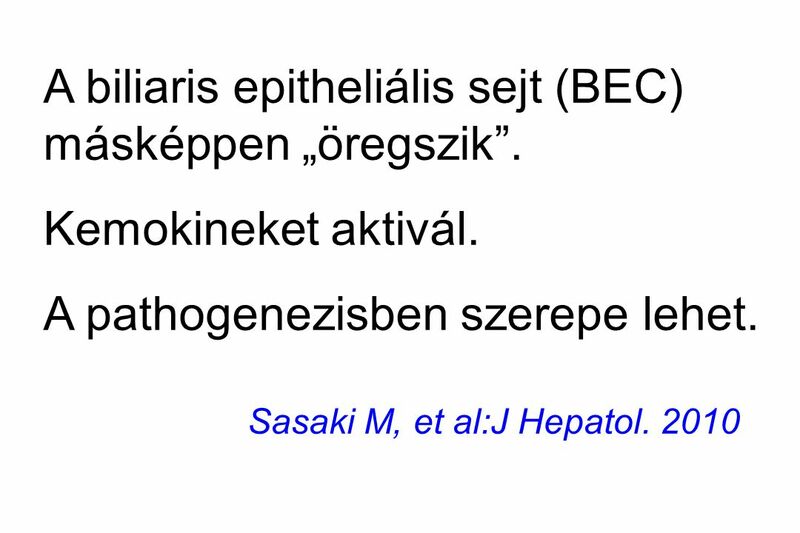 ORF, open reading frame. 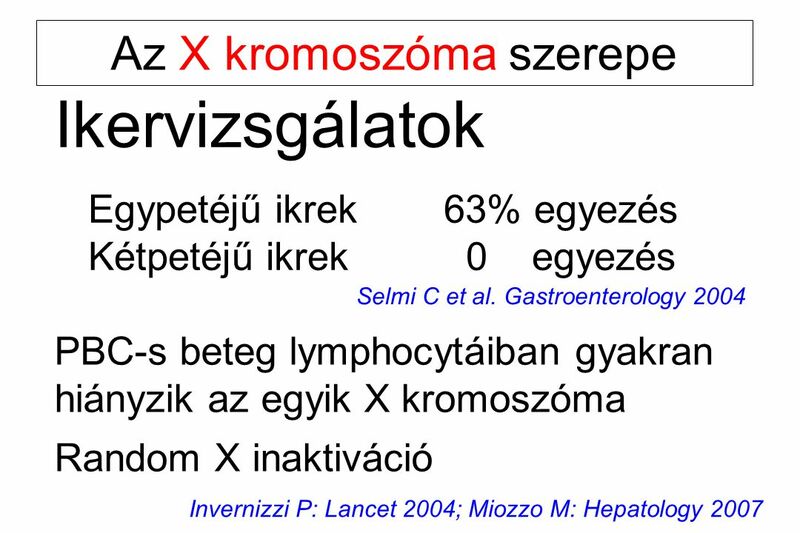 54 The number and size of cytoplasmic GW bodies varies during the cell cycle. 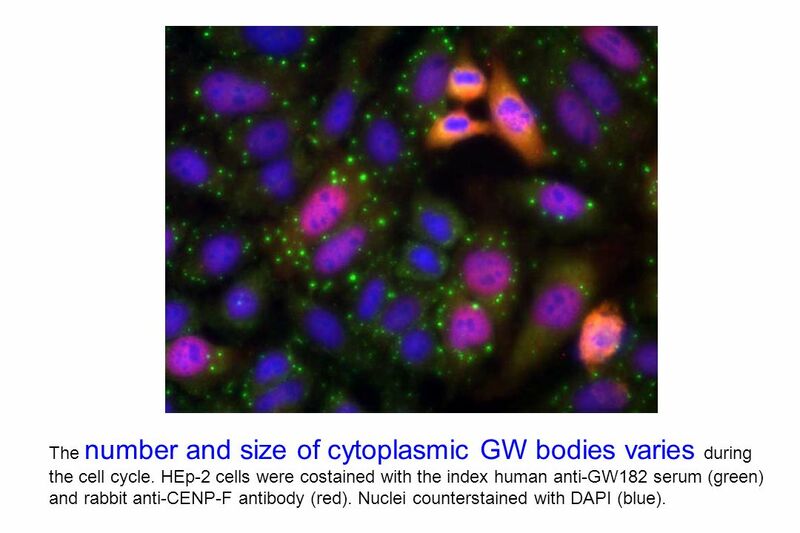 HEp-2 cells were costained with the index human anti-GW182 serum (green) and rabbit anti-CENP-F antibody (red). 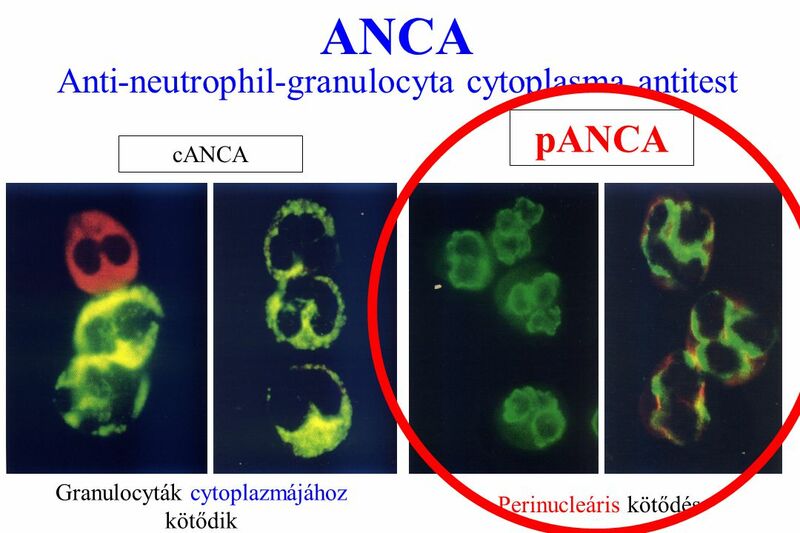 Nuclei counterstained with DAPI (blue). 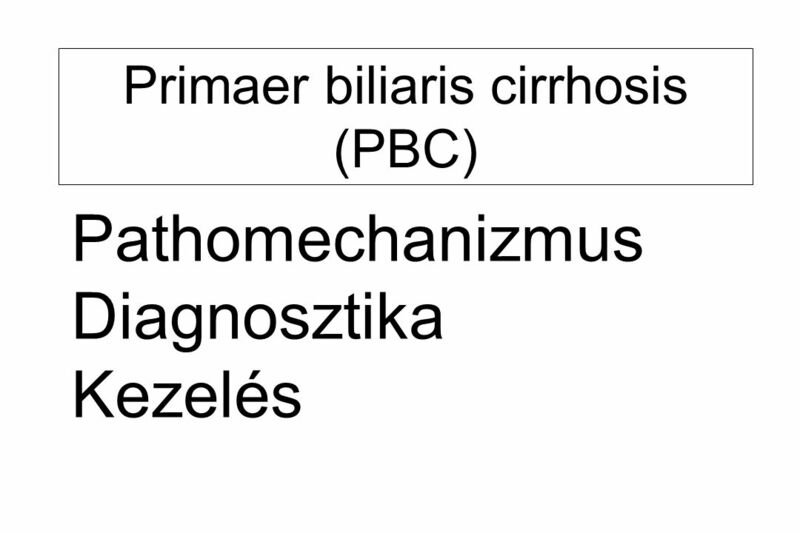 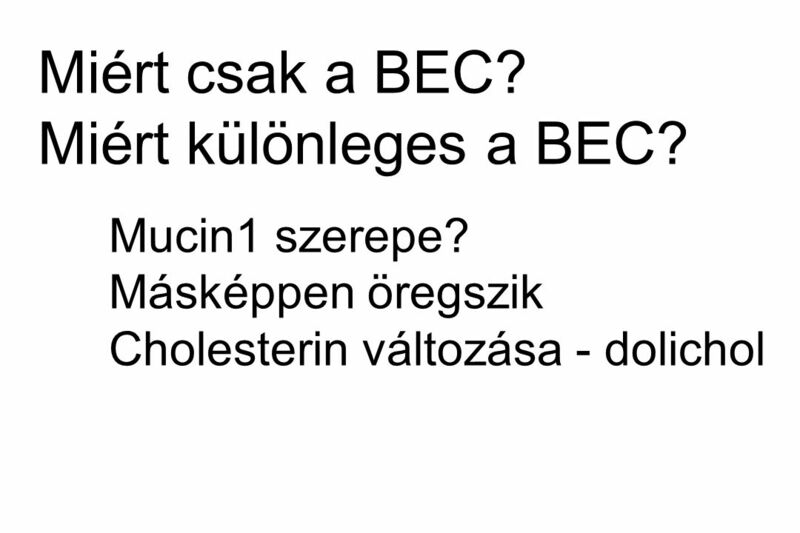 56 Biliaris epitheliális sejtekben abnormális, glycolizálatlan mucin MUC1 jelenik meg. 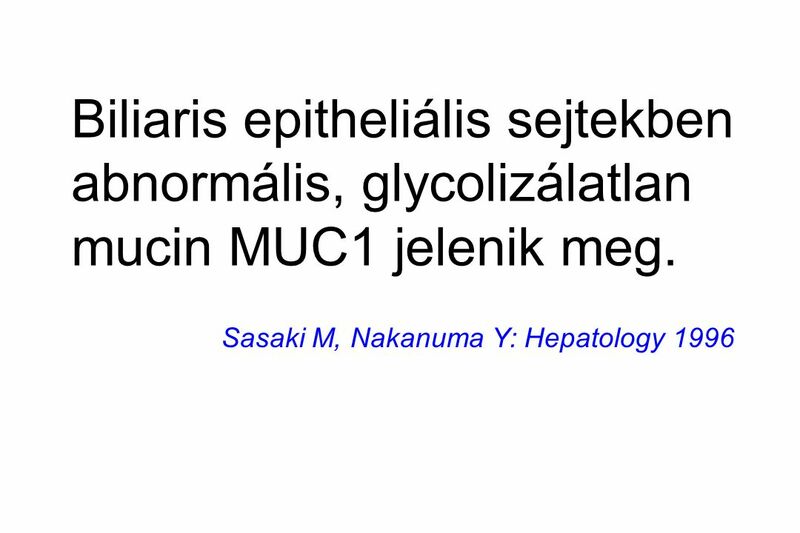 58 The state of cholesterol metabolism in the liver of patients with primary biliary cirrhosis: the role of MDR3 expression Enjoji M et al:Hepatol Int. 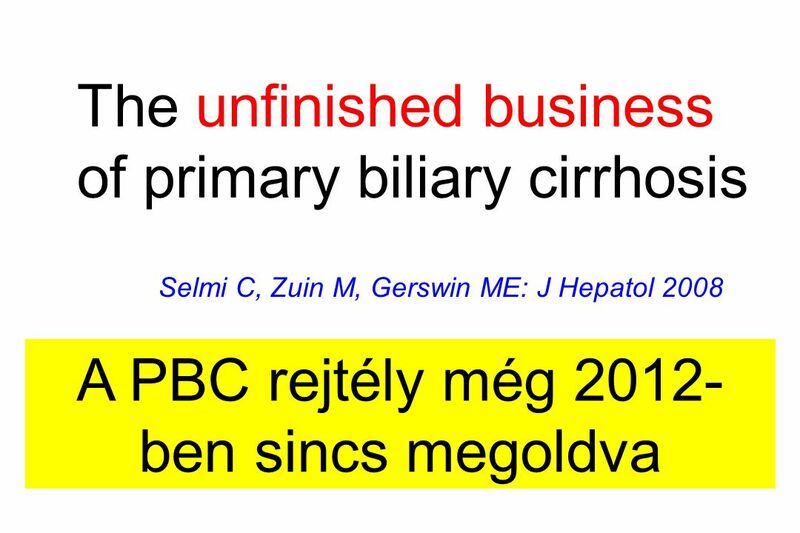 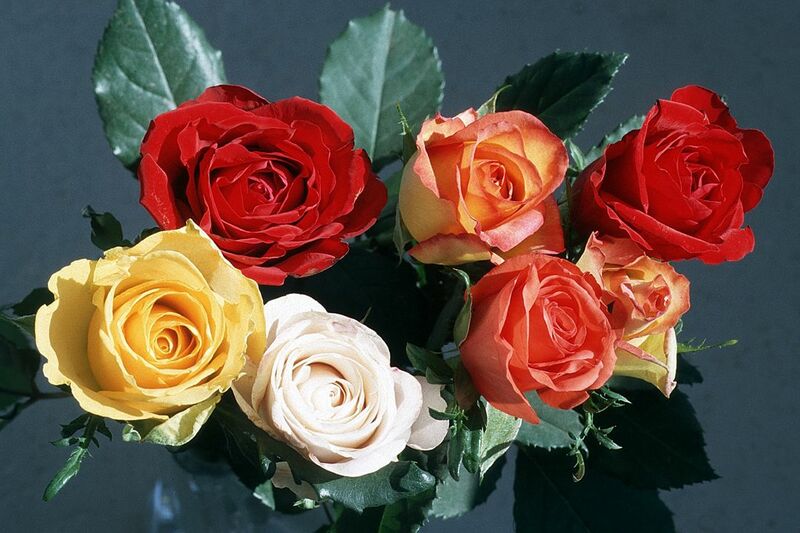 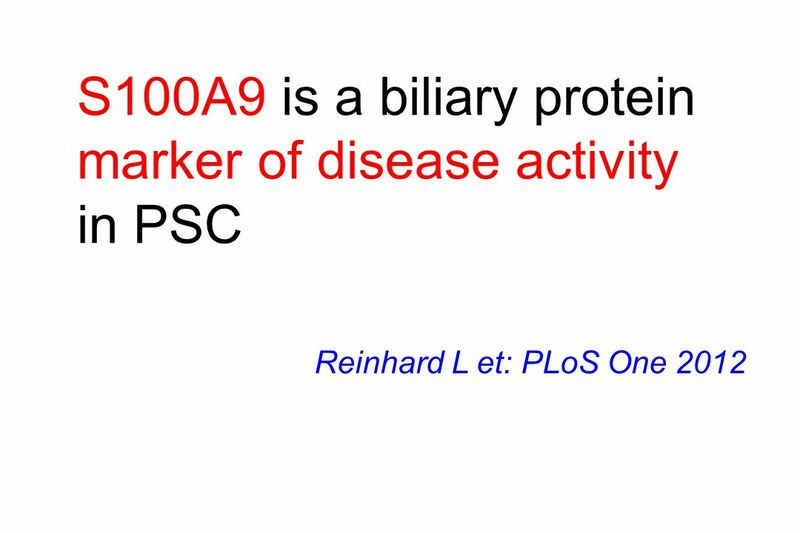 2009 Hepatocellular cholesterol metabolism was at least partially disturbed, even in the early stage of PBC. 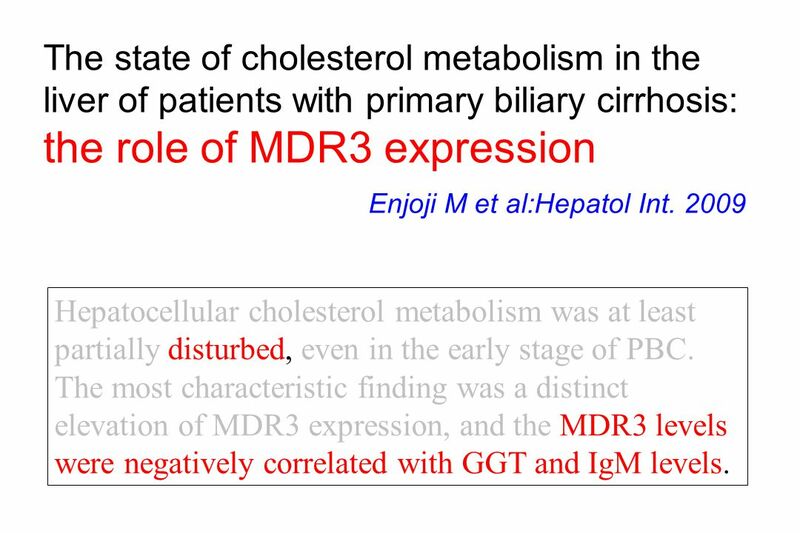 The most characteristic finding was a distinct elevation of MDR3 expression, and the MDR3 levels were negatively correlated with GGT and IgM levels. 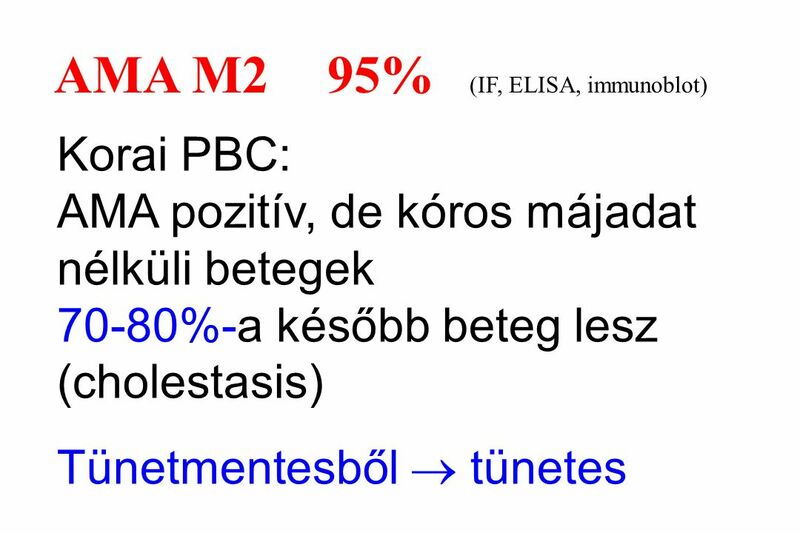 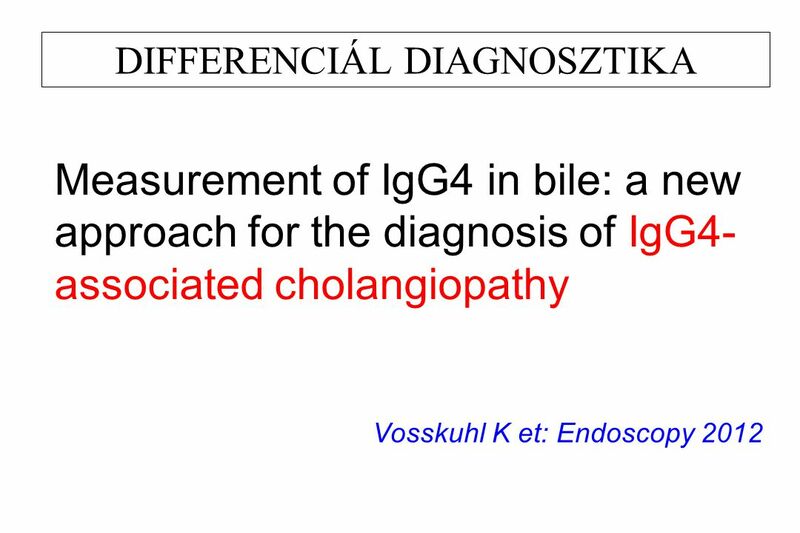 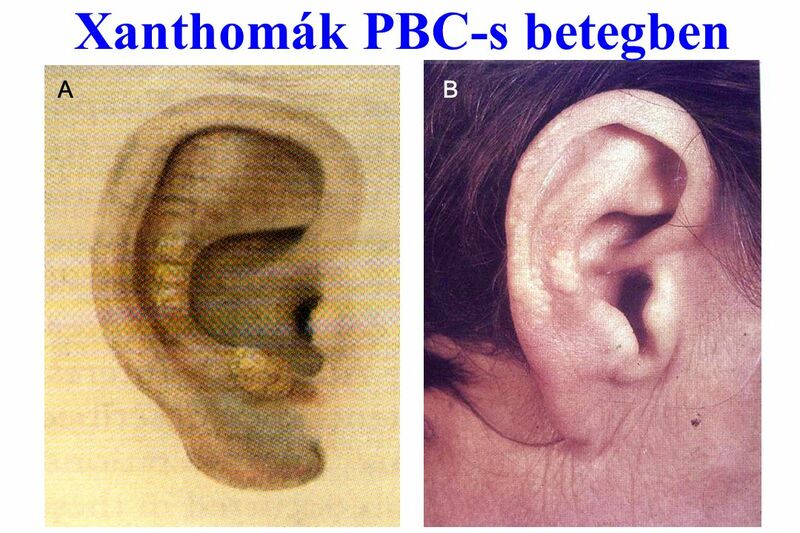 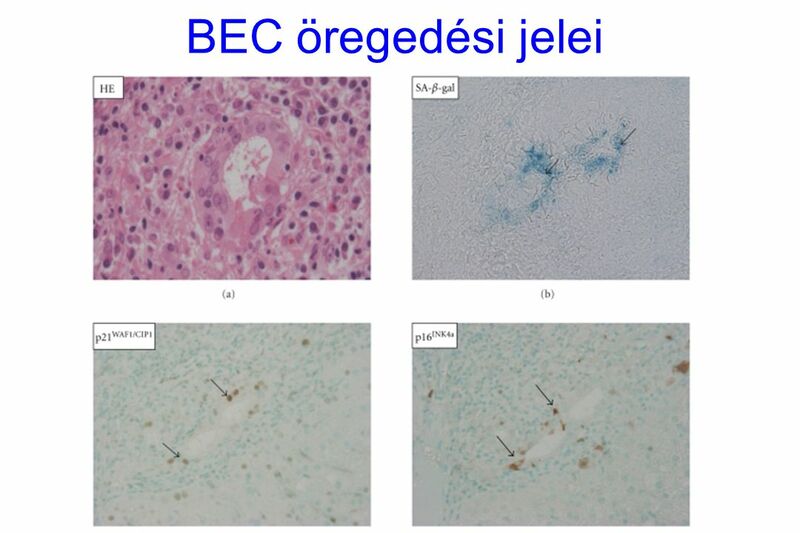 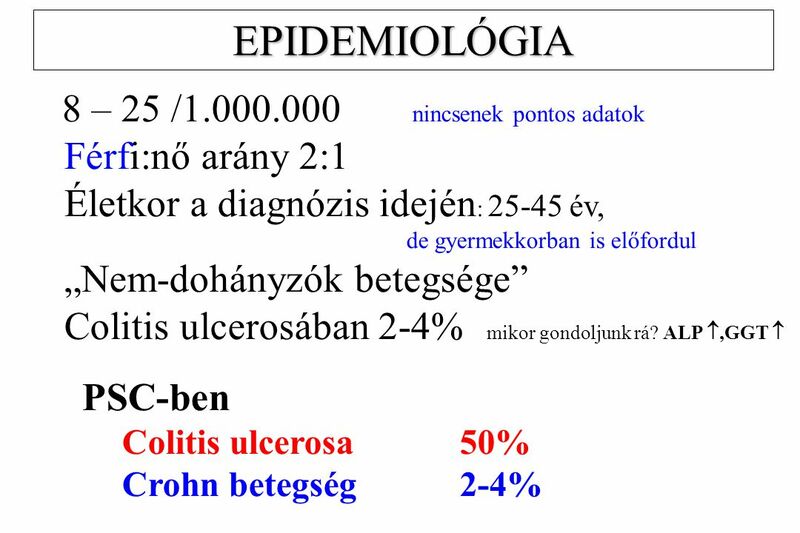 Kujper EM et al: MBC Gastroenterol 2010 Dec 110 beteg (87% nő) adatai alapján. 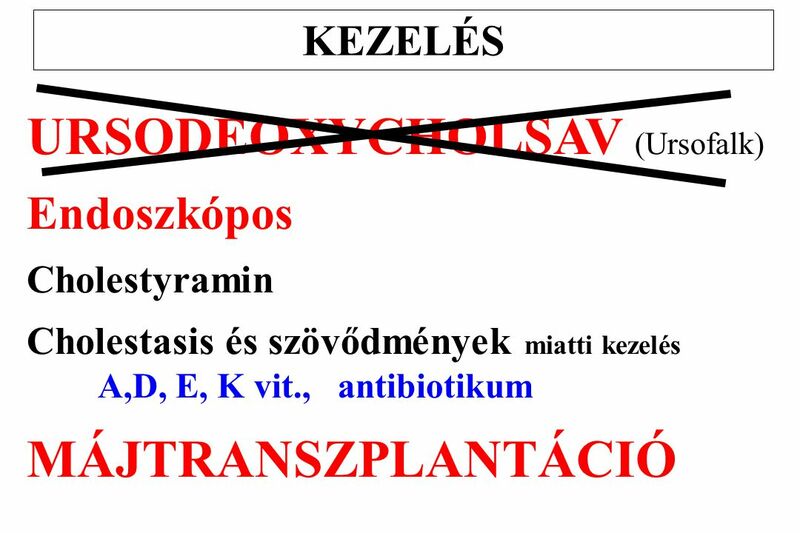 PBC miatti májátültetések abszolút száma és aránya is csökkenő tendenciát mutat. 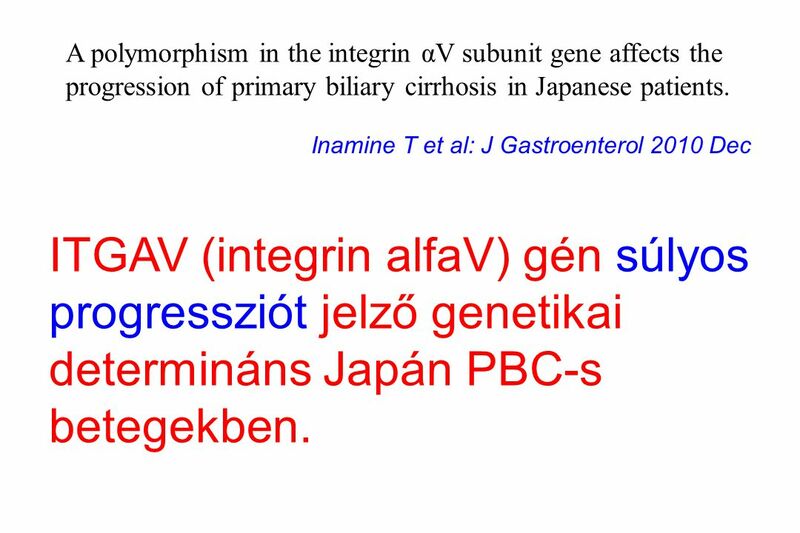 60 A polymorphism in the integrin αV subunit gene affects the progression of primary biliary cirrhosis in Japanese patients. 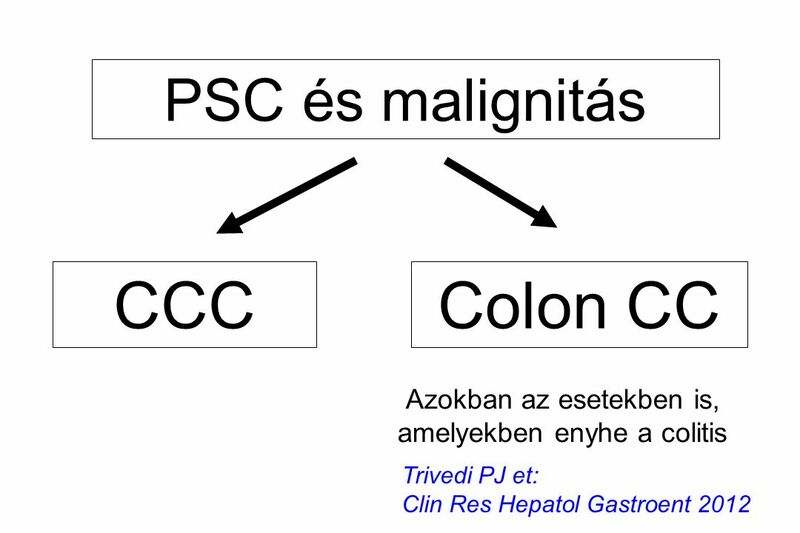 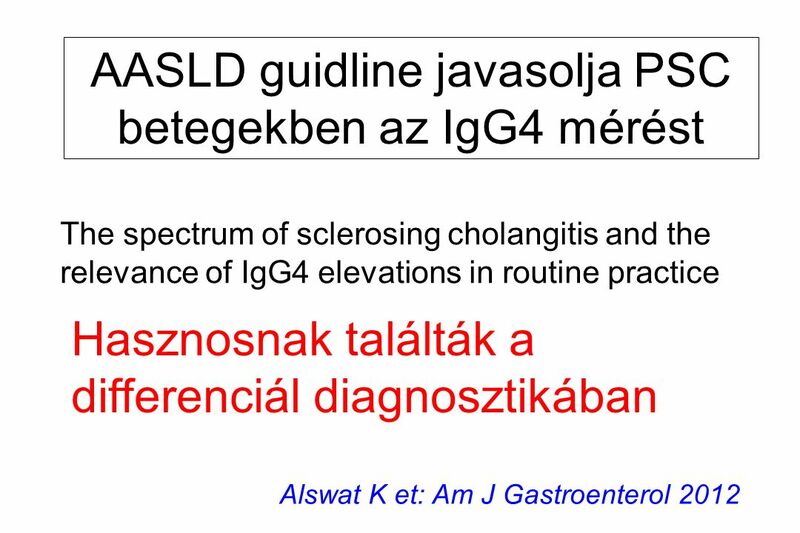 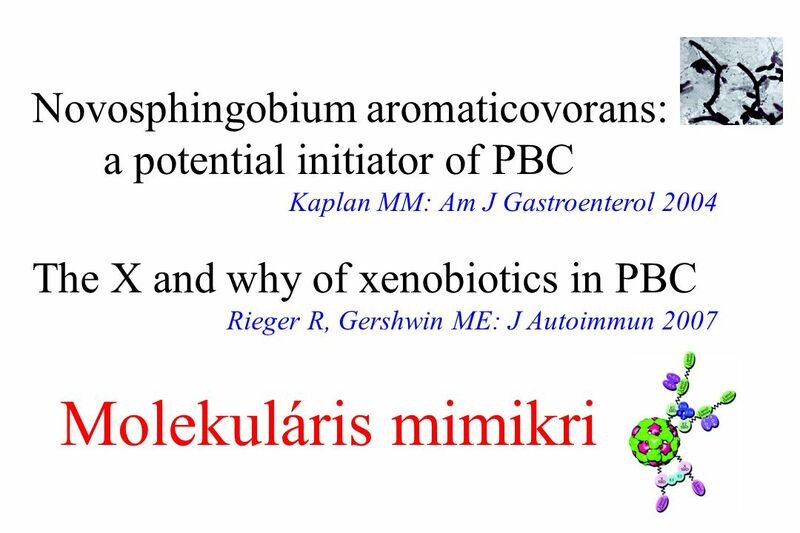 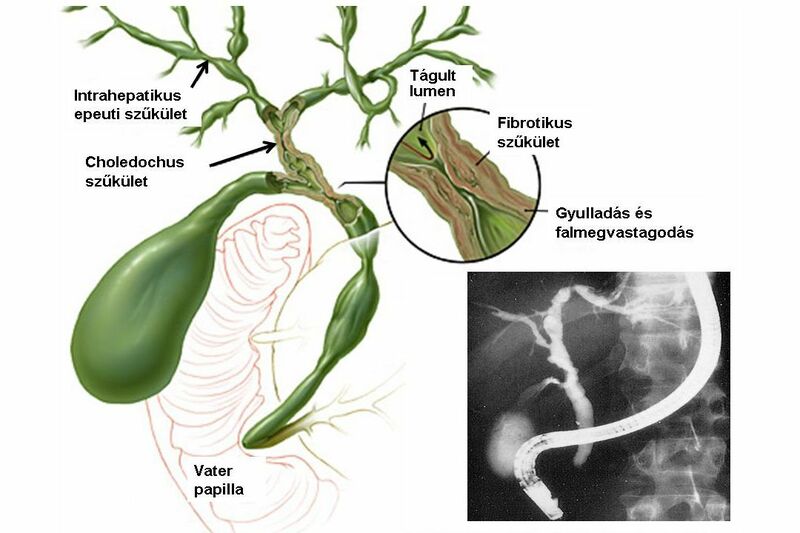 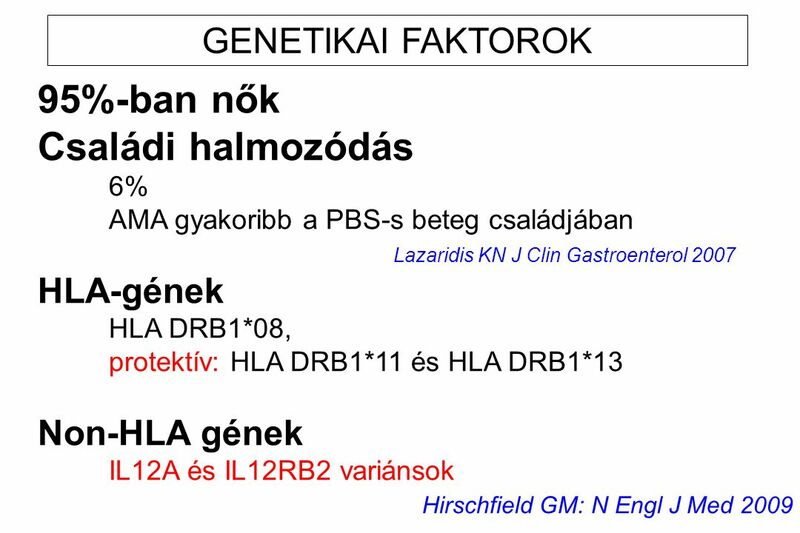 Inamine T et al: J Gastroenterol 2010 Dec ITGAV (integrin alfaV) gén súlyos progressziót jelző genetikai determináns Japán PBC-s betegekben. 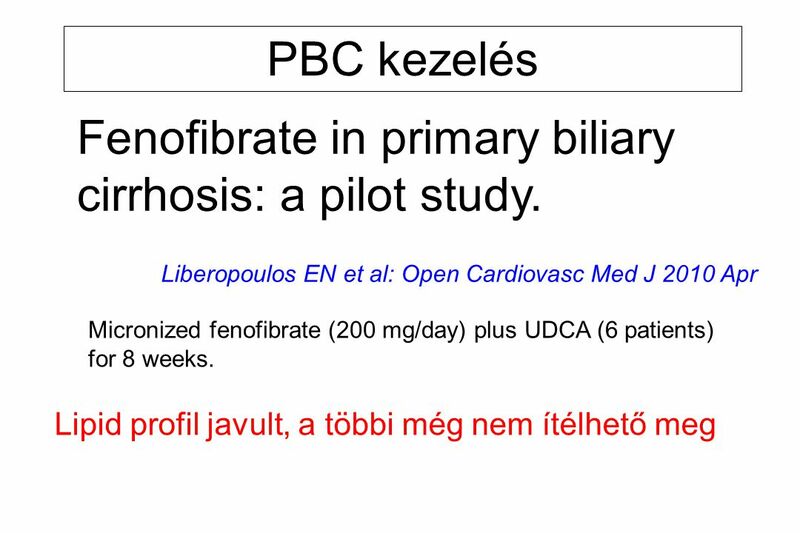 61 Fenofibrate in primary biliary cirrhosis: a pilot study. 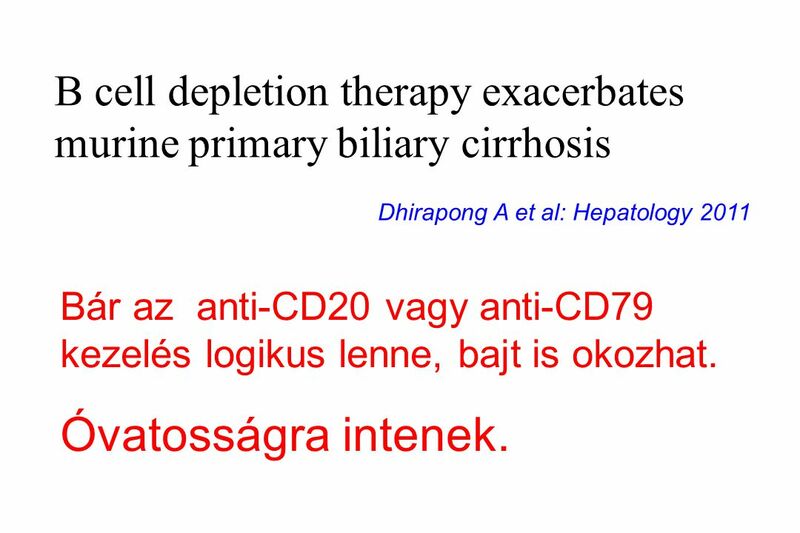 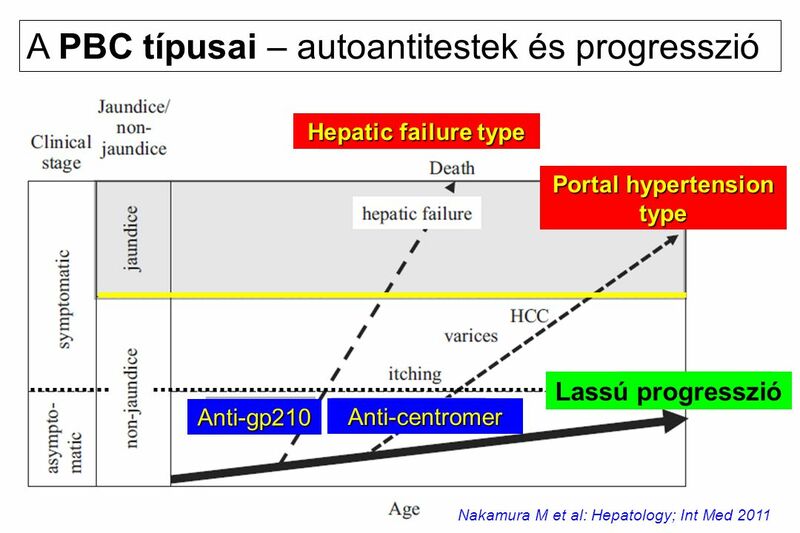 Dhirapong A et al: Hepatology 2011 Bár az anti-CD20 vagy anti-CD79 kezelés logikus lenne, bajt is okozhat. 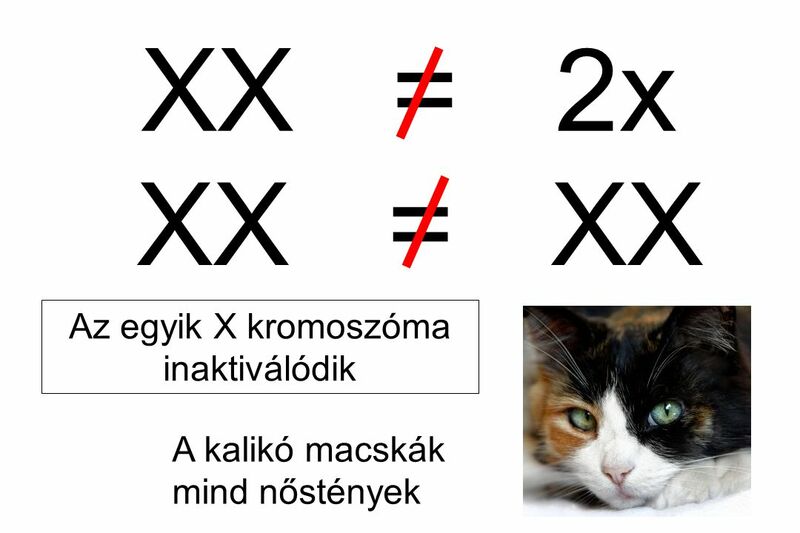 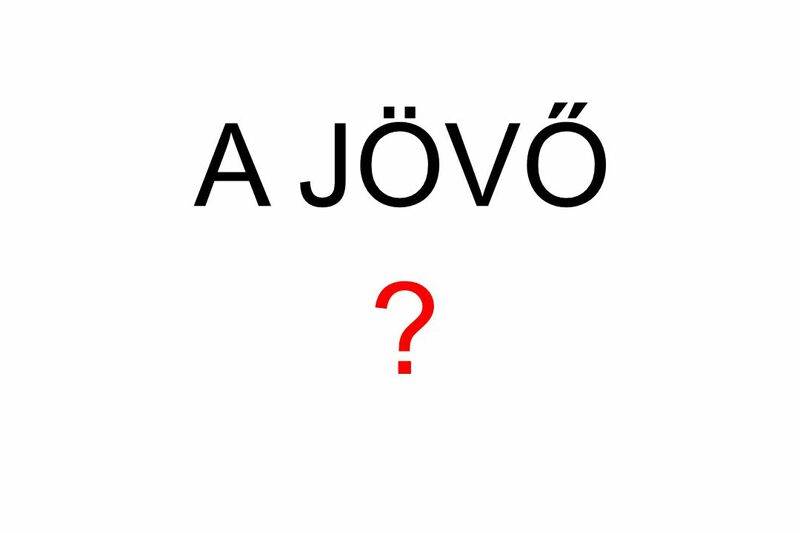 Óvatosságra intenek. 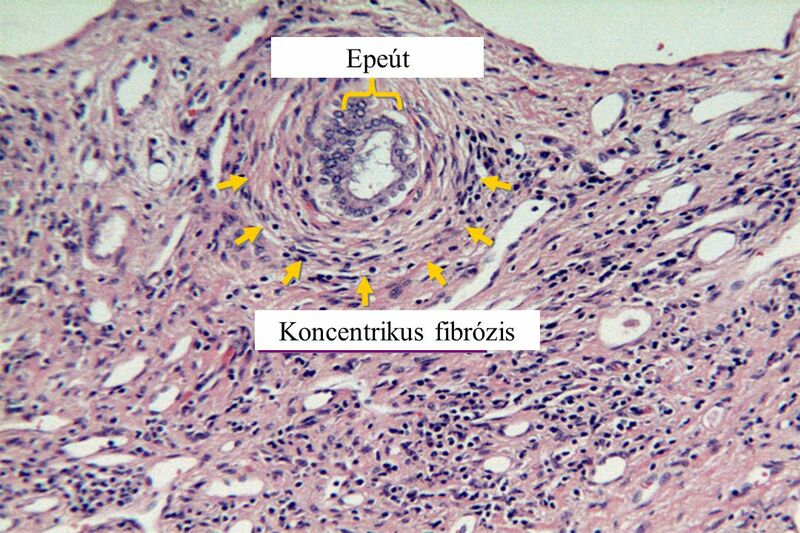 Bile duct Concentric fibrosis Epeút Koncentrikus fibrózis Slide 27 Concentric Fibrosis in PSC In PSC, the concentric fibrosis encasing the interlobular bile duct is the “classic” histologic lesion. 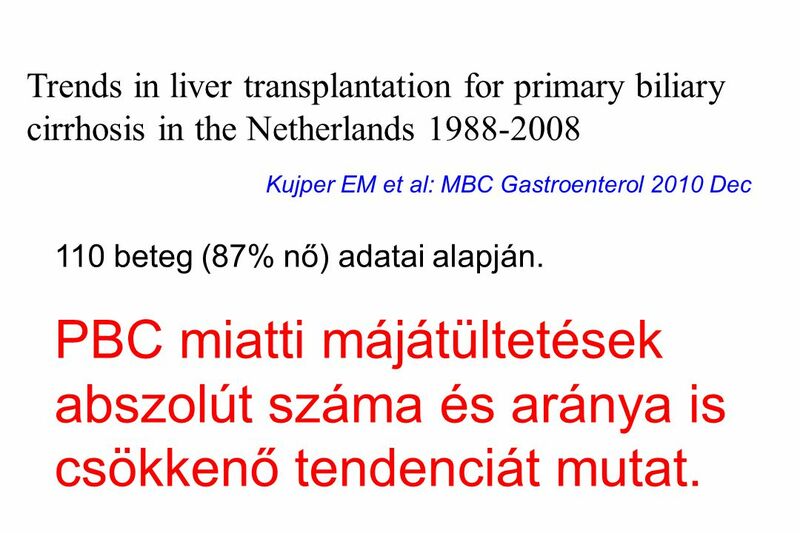 89 The overall aim of the proposed research project is to identify novel therapeutic strategies for chronic cholangiopathies which are important indications for liver transplantation and causes of liver-related death. 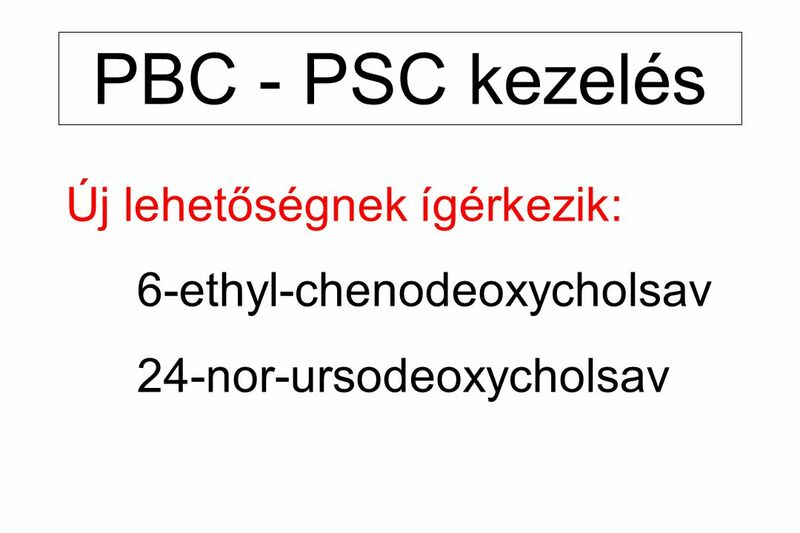 A side chain-shortened bile acid such as 24-nor-ursodeoxycholic acid (norUDCA) has been chosen since this biochemical modification results in cholehepatic shunting and targeting to the bile duct epithelium, effects which should provide the distinct pharmacological properties required for the treatment of cholangiopathies such as sclerosing cholangitis. 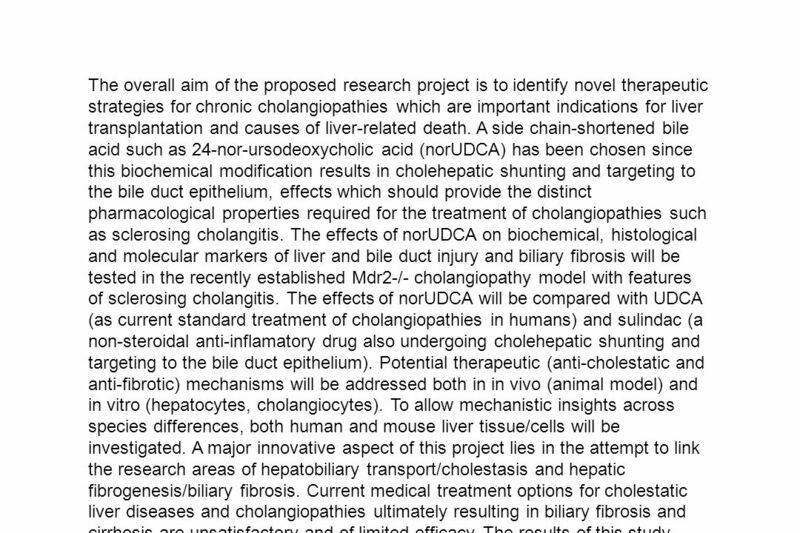 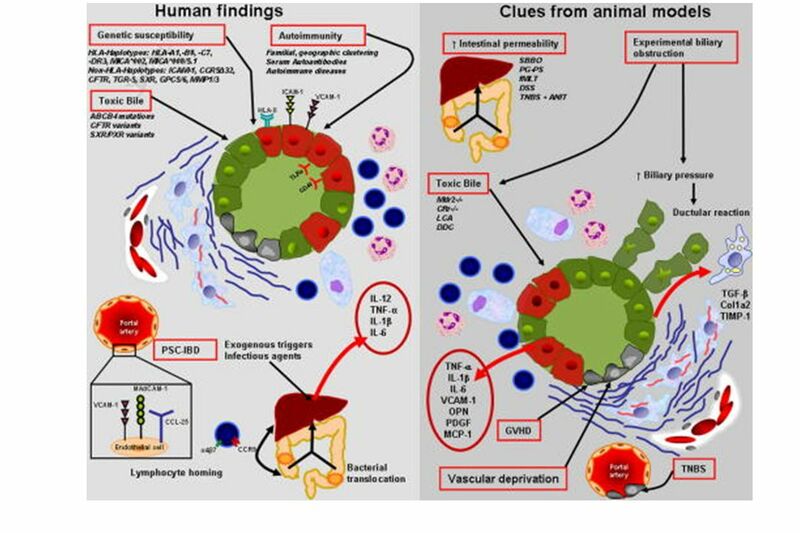 The effects of norUDCA on biochemical, histological and molecular markers of liver and bile duct injury and biliary fibrosis will be tested in the recently established Mdr2-/- cholangiopathy model with features of sclerosing cholangitis. 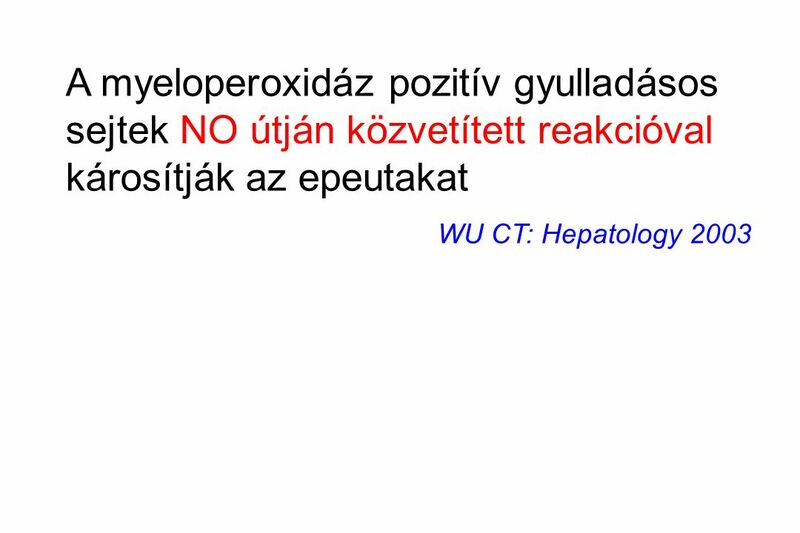 The effects of norUDCA will be compared with UDCA (as current standard treatment of cholangiopathies in humans) and sulindac (a non-steroidal anti-inflamatory drug also undergoing cholehepatic shunting and targeting to the bile duct epithelium). 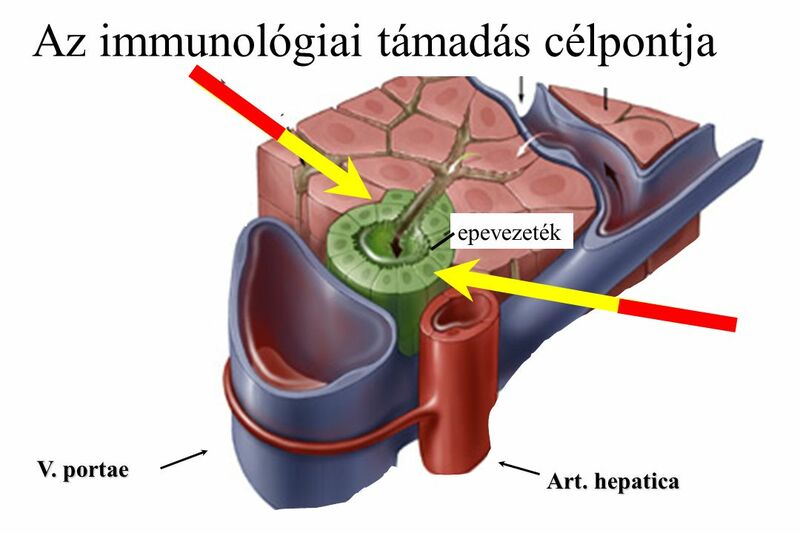 Potential therapeutic (anti-cholestatic and anti-fibrotic) mechanisms will be addressed both in in vivo (animal model) and in vitro (hepatocytes, cholangiocytes). 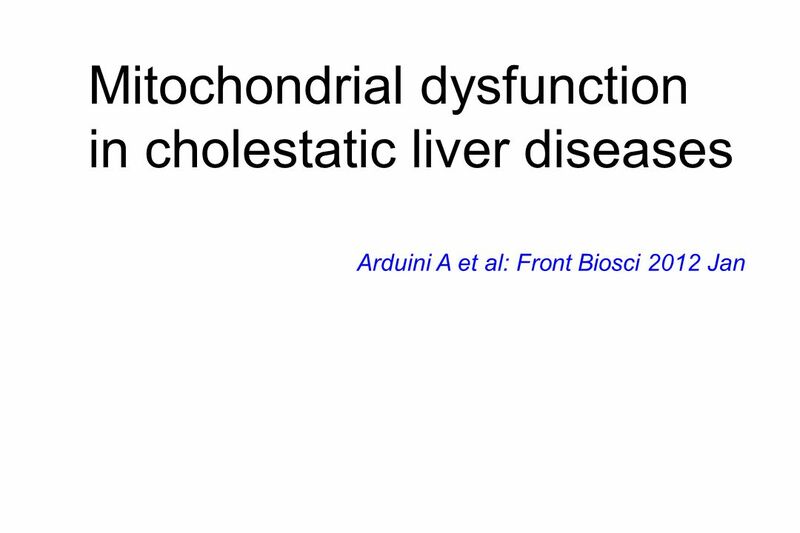 To allow mechanistic insights across species differences, both human and mouse liver tissue/cells will be investigated. 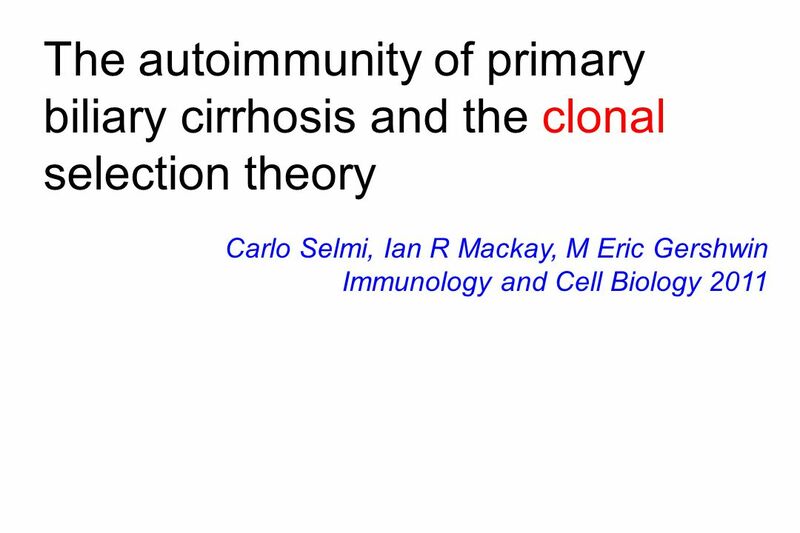 A major innovative aspect of this project lies in the attempt to link the research areas of hepatobiliary transport/cholestasis and hepatic fibrogenesis/biliary fibrosis. 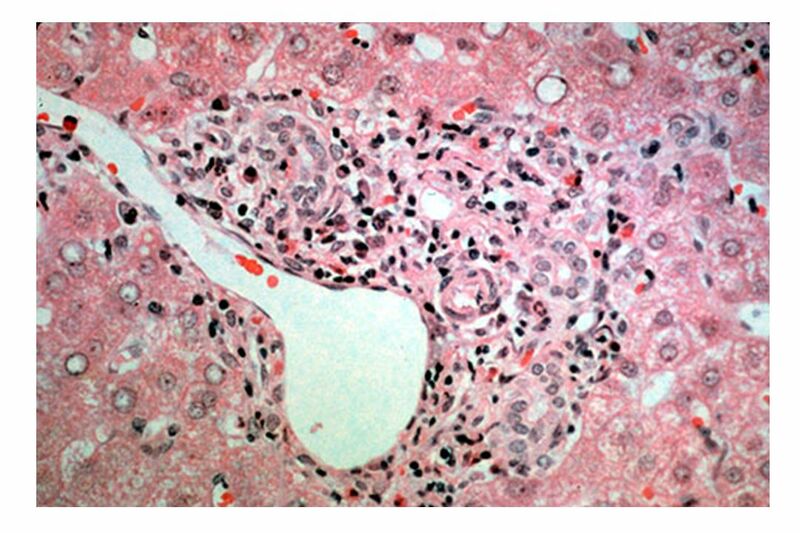 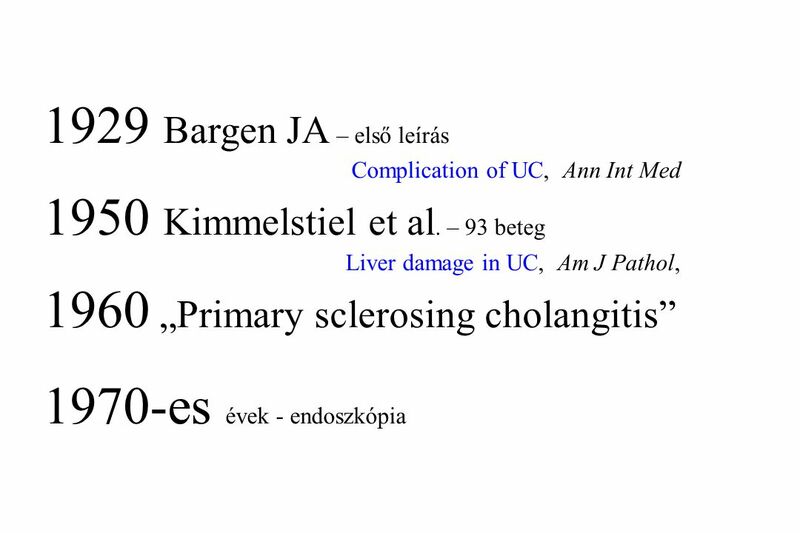 Current medical treatment options for cholestatic liver diseases and cholangiopathies ultimately resulting in biliary fibrosis and cirrhosis are unsatisfactory and of limited efficacy. 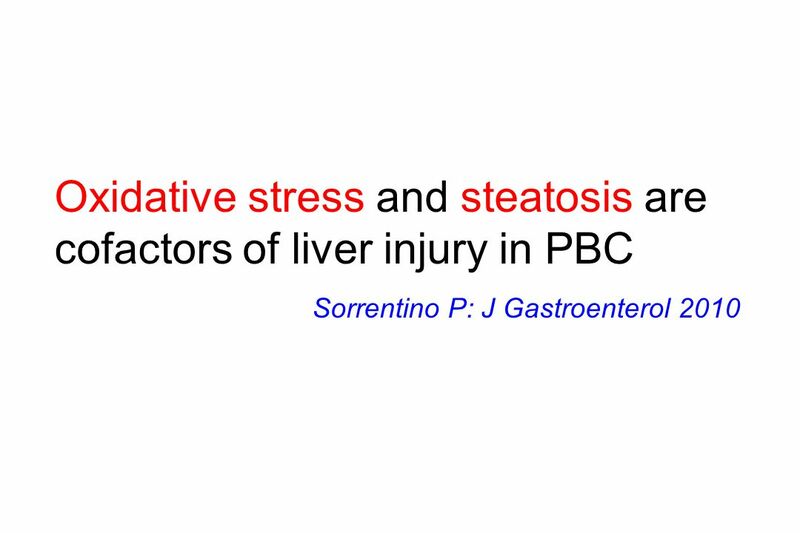 The results of this study should contribute to novel therapeutic strategies against cholestatic liver diseases and biliary fibrosis. 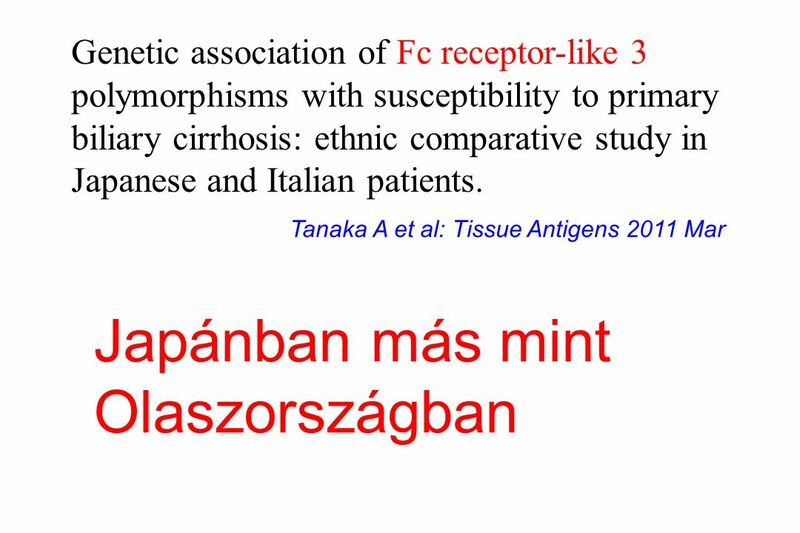 Moreover, the expected finding should have major general implications for hepatic fibrogenesis beyond the area of cholestasis. 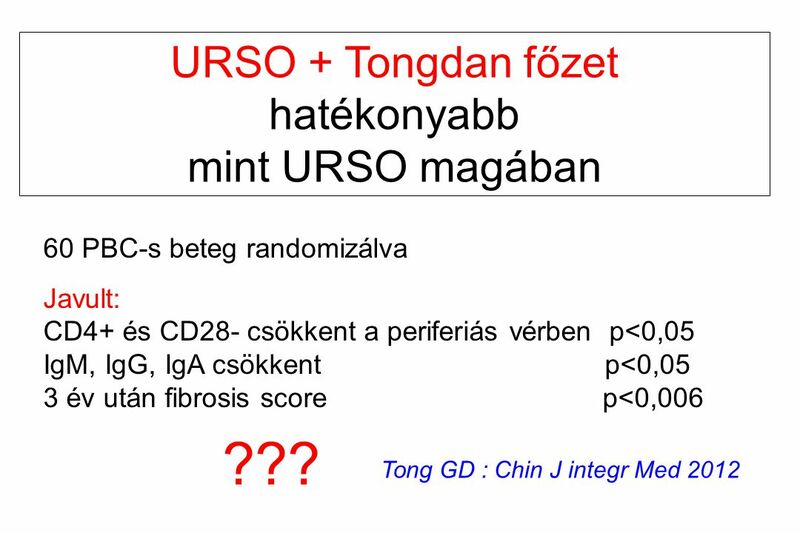 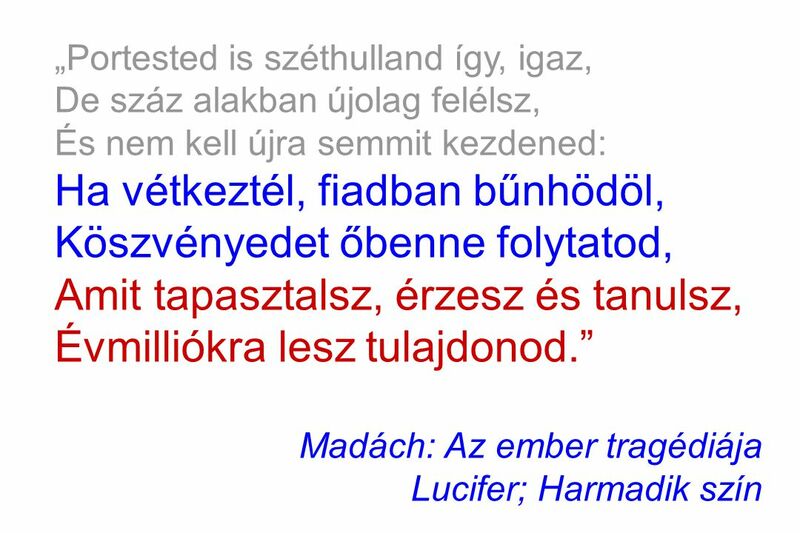 Újabb eredmények a vénás rendszer fiziológiás és kóros működésének a kutatásában II. 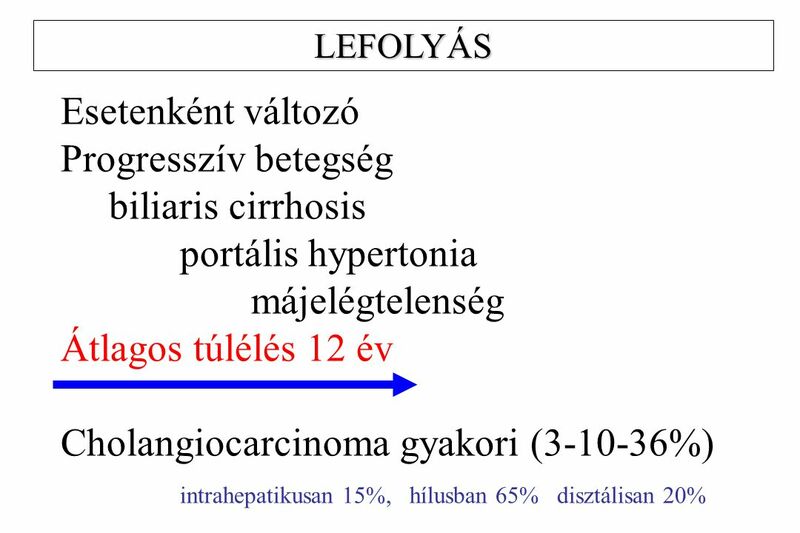 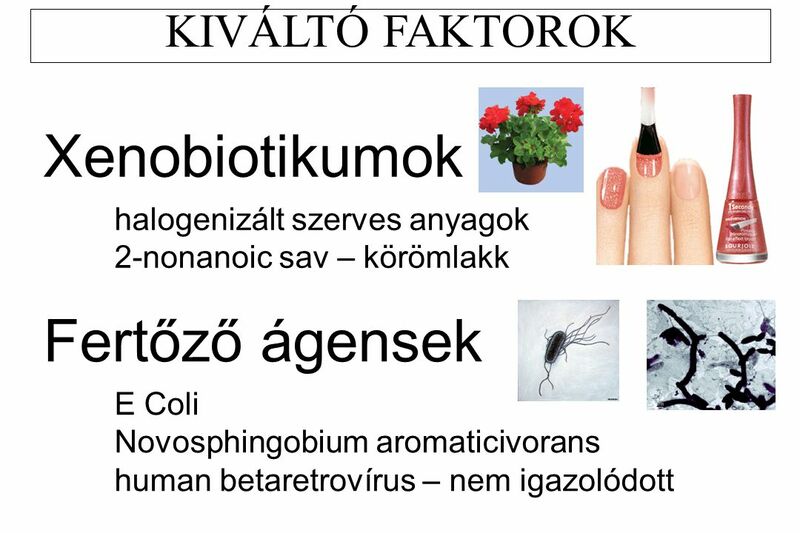 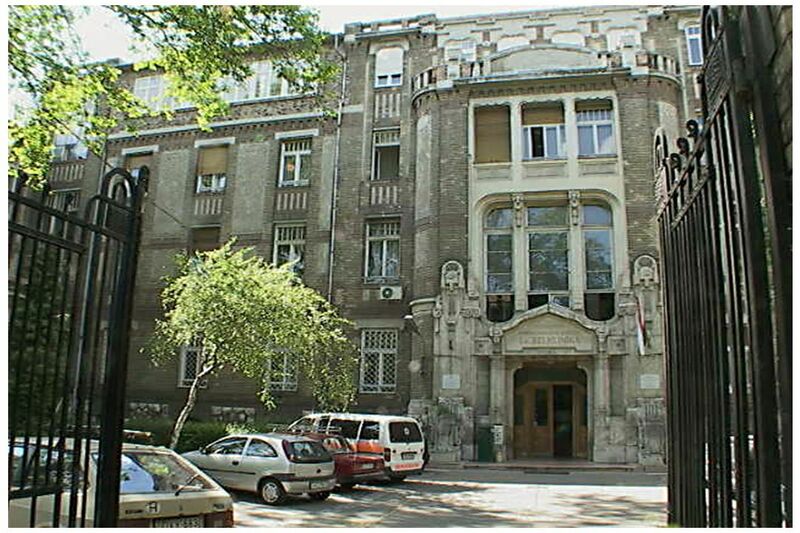 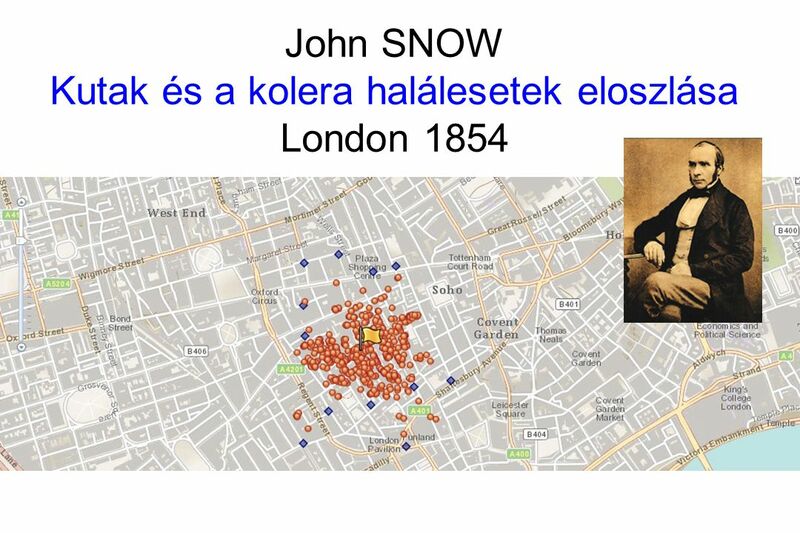 Prof Monos Emil és dr Nádasy György L Klinikai Kisérleti Kutató- és.